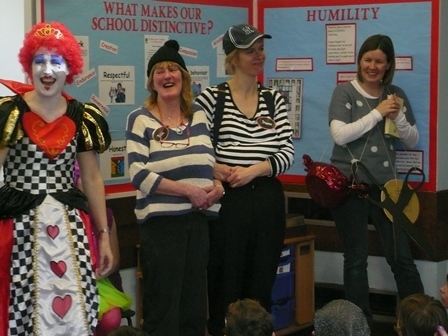 With it being World Book Day on Thursday 7th March, we celebrated at St. Mary's by dressing up as our favourite book characters - including all the staff! 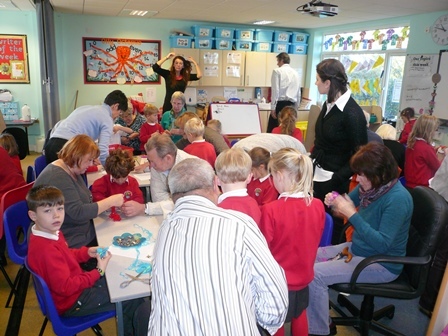 We were joined by lots of dads and grandads who joined in with all the activities in classes during the morning. They helped by reading to the children, making bookmarks, drawing book covers, writing book reviews, and drawing their favourite book characters. All the children - and adults! - had great fun dressing up and working with our visitors and you can see all the photos from the day below, including a photo of the costume winners from each year group. A big thank you for all the dads and grandads who were able to join us on the day - we hope that you had as much fun as we did! In the evening, Mrs Boast and Mrs Bedford hosted our Parent Reading & Phonics Workshop for parents of children in Reception and Year One. The focus was on how we teach phonics and reading in school. Thank you to all those who attended and to Mrs Boast and Mrs Bedford for leading the workshop. On the morning of Thursday 21st February, Classes Three and Four visited St. Mary's Church in the village for a guided tour with Reverend Martin. He showed the children the different 'rooms' within the church and explained why we are the church, not the building. Both classes showed good knowledge and understanding but came away knowing even more about our local church. Thank you to Reverend Martin for his time & work with our children, and to our parent helpers who were most knowledgeable too! On Wednesday 20th February our PCWT led collective worship for the whole school based upon our current Christian value focus of endurance. The team of Year 5 and Year 6 pupils acted out the bible story of Noah using cardboard models that they had made to animate the story, followed by calling up some pupils to show their endurance during a minute of star jumps! Well done to the whole team for all their hard work which was greatly enjoyed by all the children and staff. Sandra Hayes - Annual Awesome Award Winner! On Tuesday 19th February, our cook, Sandra Hayes, was presented with the ABM Annual Awesome Award for 2018. Earlier in 2018, Sandra won a monthly award for the love and support that she gave her colleague Kath when her husband sadly passed away. Last month, the ABM directors chose Sandra as the annual award winner for 2018 and Alison Lisney from ABM was in school today to present Sandra with her richly-deserved award. Sandra is such a caring and thoughtful individual and this award is just one of the many examples of this - many congratulations Sandra. On Friday last week, our FOSM hosted another Film Night here in school. Around 70 children enjoyed the great film 'Early Man' whilst munching on popcorn and cuddling their teddies! Thank you to our FOSM team for putting this event on for the children and for all the parent helpers that were on hand to watch the film too! This event raised an impressive £122 which will be used to purchase further resources for our children here in school. Thank you one and all. In January, a national tutoring company ran their Awesome Teacher Awards, where students and parents were able to nominate their favourite teacher. St Mary's very own Mrs Walmsley was kindly nominated by Mya "...because she is always warm, positive and encouraging. She hardly ever shouts and has faith in pupils of all abilities." Mya presented Mrs Walmsley with her certificate this afternoon in front of the whole school and staff. Many congratulations to Mrs Walmsley for her well-deserved nomination and thank you to Mya for this lovely gesture! Today we have had our friends from YoYo in school to lead our collective worship. The team focussed on our current Christian value of endurance, linking this to the story of Peter in the bible, who showed great endurance when others were unkind to him. The children loved the YoYo songs and dance moves and well done to Reuben who showed great endurance during the burpee endurance challenge! 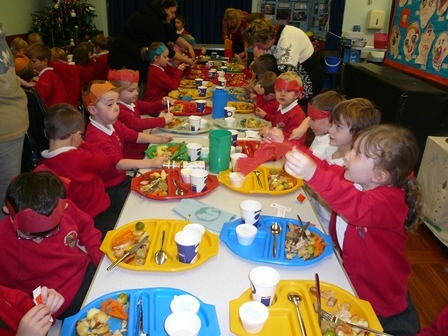 On Wednesday 19th December we enjoyed our Christmas lunch in school. A big thank you to Mrs Kath Speed and Mrs Sandra Hayes for producing such delicious food - even the sprouts were gobbled up! The children (and staff!) were also able to wear their Christmas jumpers in support of Save the Children. We managed to raise £54 to support this great cause, helping children around the world with essential food, healthcare, education and protection - thank you for your kind donations. It was lovely to welcome local residents in to school for our annual Carols Around the Tree performance. The children sung songs from our Christmas nativity and also some traditional carols too. 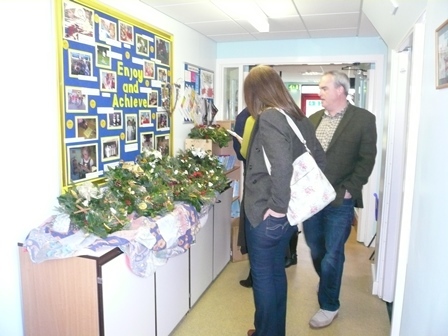 We also presented our guests with decorations made by children as a Christmas gift from us all. Thank you also to Reverend Martin Otter for his prayer and blessing. 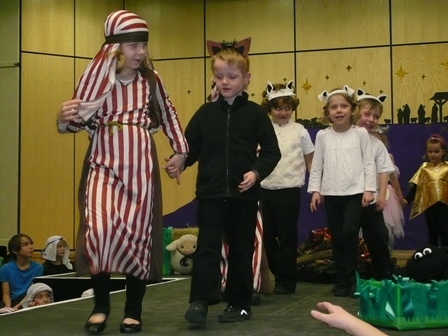 On Friday 14th December, the children performed our Christmas Nativity at Askham Bryan College Conference Hall. The performance of 'The Real Nativity' went down a treat! The children's acting was superb and their singing pitch perfect. Thank you to Mrs Beighton for co-ordinating it all and to everyone for their roles in putting on such a great show. Here are some photos from the evening. 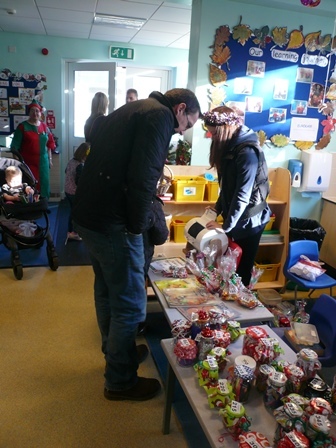 On Saturday 8th December we opened our doors to our families and local community for our annual FOSM Christmas Fair. There was much to enjoy including games created by our Key Stage 2 children, turkey sandwiches, cakes, raffle, tombola and painting. The fair was so popular that Father Christmas even paid us a visit too! Our FOSM team were amazing in organising, setting up, running and tidying up after the fair, so we thank them for all their hard work and support with this event which was greatly enjoyed by all those who came. Everyone's efforts resulted in us raising a whopping £1600 for school resources, which is an increase on last year. Thank you one and all! 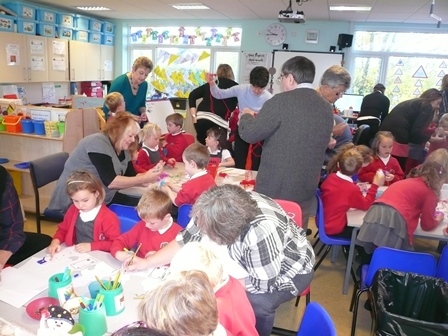 It was a pleasure to welcome 74 grandparents in to school on Wednesday 5th December for our annual Grandparents' Morning. They joined the children in all the classes making a range of different Christmas decorations which were then placed on our Christmas tree. Thank you to all our visitors for making the day so special for all the children. Thank you to YoYo who came in to lead their 'It's Your Christmas' sessions with our Reception and Year Ones, then our Year Three and Fours, followed by a whole school collective worship session based on the Christmas story. The children were actively engaged in the activities, took part in the drama and were reminded of the real reason for celebrating Christmas - the birth of Jesus Christ. Our PCWT planned, organised and led our collective worship on Wednesday 21st November, based on the Christian value of friendship. Well done to James, Erin, Betsy, Holly, Mya and Rhiannon who led a fun and interactive worship session! On Tuesday 20th November and Wednesday 21st November, our Year 2 and Year 4 hockey teams braved the cold and rain to compete in the York School Sports Network competitions against other primary schools at York High School. The Year 2s were unbeaten throughout their games, winning the competition, and the Year 4s narrowly finished runners-up, winning and drawing all their games bar one. Both teams deserve a huge round of applause from us all for their great success - very well done! Thank you to Mrs Beighton for taking our Year 2 team to the tournament. 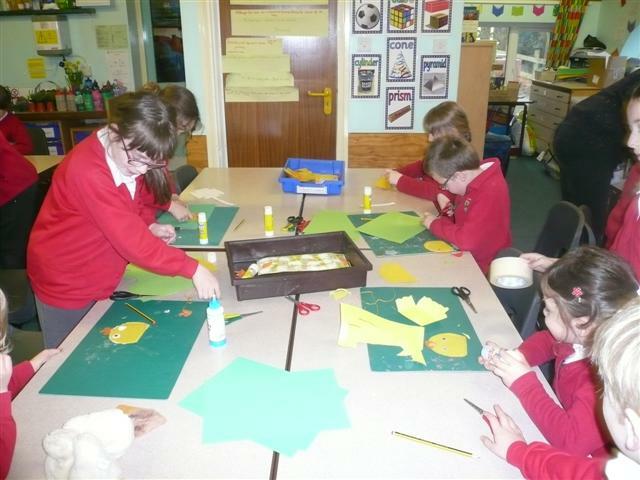 On Friday 16th November we also held our FOSM Christmas Craft afternoon. During the session the children made a range of Christmas decorations which were then sold at our Christmas Fair to raise money for resources in school. Great fun was had by all with plenty of glue and glitter getting everywhere! We held our annual Children in Need day on Friday 16th November, with children coming to school dressed in anything spotty or yellow! There were some great outfits and the children raised £202 from their donations. This money goes to help support a range of children and families around the United Kingdom, so thank you for your generous donations. On Friday 9th November, we held our Remembrance Service here in school with the children and all the staff. The children presented the different poppies that they had created in remembrance of those who died during both wars and we included a poem on war that Evy had written herself. This year was the 100 year anniversary of the end of World War One and some of our children also attended the service at St. Mary's Church too, which included the lighting of the beacon on the village green. The children managed to raise £96 for the Royal British Legion from their donations when buying their poppies in school. Many congratulations to Sandra Hayes from our ABM kitchen staff who has won the Team Member Award for September from ABM, our catering company. Sandra was chosen as she has been an invaluable support to her colleague Kath Speed and she wins a £50 shopping voucher. Very well done from us all Mrs Hayes! 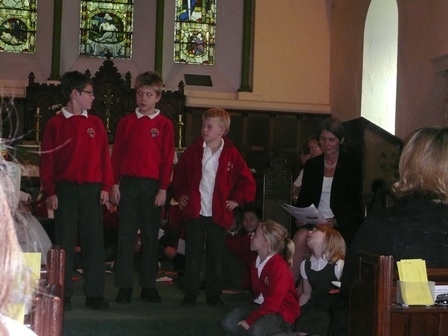 On Tuesday 16th October, Key Stage 2 undertook their collective worship in St. Mary's Church. Thank you to Reverend Martin Otter for leading the service and to Ann Watson and Sue Elgie for their support too. 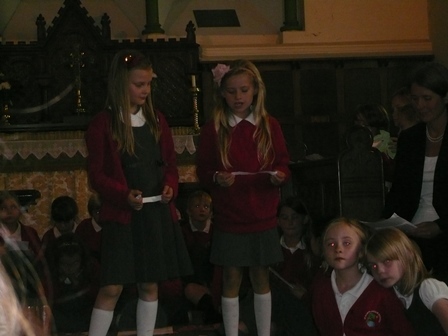 On Friday 12th October we celebrated our Harvest Service in St Mary's Church. Thank you to all our children and families who kindly brought in items which were donated to Carecent York, a charity supporting homeless, unemployed or otherwise socially excluded members of our local community. A very big well done to our netball / High 5 team who participated in the York Schools tournament at Manor CE School on Wednesday 3rd October. The team performed very well, winning, drawing & losing games. We and all the parents who were there supporting were very proud of you! After a very busy summer holiday with our school building undergoing significant improvements, we are now back in school and are very happy with these fantastic upgrades! A big thank you to the local authority and the contractor team who have been very supportive of our needs here at St Mary's. We now have all four classes in bigger classrooms; a new Early Years outdoor classroom; an extended playground; a set of new laptops; improved wifi for our computing needs; more children's toilets, including an accessible toilet; and lockers for the children - which was what they were most excited about! Thank you to all our staff for managing this change so well and for working hard to set their new classrooms up ready for the start of the new school year in just a few of days! These improvements will ensure that we have the very best environment for all our children to develop as individuals and learners. Here are some photos of the work from start to finish. On Friday last week we held our Year 6 Leavers' Assembly with the whole school and mums and dads of children in Year 6. It was an emotional assembly during which we heard many lovely words spoken about our Year 6s by their peers. They are a mature and successful group of individuals and on behalf of all of us here at school, I would like to wish them all further happiness and success in the future. 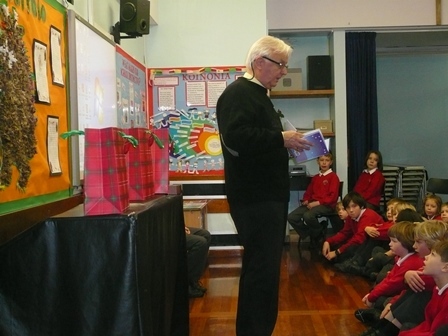 The children were presented with a bible by Reverend Richard Battersby from school. This year's Big Sing Challenge theme was Les Miserables. 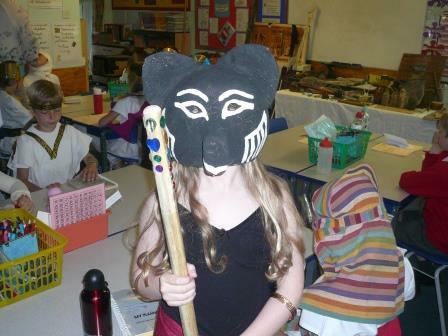 The performances were all very enjoyable and tricky to judge, however the contest was deservedly won by Class 1. Congratulations to all classes for the efforts that had gone into learning and practising the songs, and also into your costumes and outfits too. Thank you to Miss Sam Buckley, Head of Visual and Performing Arts at Tadcaster Grammar School, for helping with the judging and presenting the highly sought after trophy. Very well done Class 1 for your success! On Wednesday 11th July, we held a surprise retirement assembly for Mrs Pat Goudge. Mrs Goudge has been an integral member of the school staff for 20 years, working in all classes throughout the school. Her dedication and committment to the school and its pupils will be a real loss. She will be greatly missed by all of us here but we wish her every happiness in her retirement, walking her dog, honing her cooking skills and visiting antique fairs across the county. All the very best Mrs Goudge! On Tuesday we held our annual Sports' Celebration Evening to present medals to all the children that have represented the school in competitive sporting fixtures. This year we have competed in football, girls' football, cricket, netball, cross-country and hockey at Year 2, Year 4 and Year 6 - quite an achievement for a small school. Our sportsmen and sportswomen have proudly represented the school with skill and endeavour, always showing great teamwork. Here are some photos from the evening. On Sunday 8th July our Year 4s, having progressed as winners of the south of York group, took part in the North Yorkshire Finals at St. Margaret's School in Escrick. We were up against 11 other schools from as far afield as Scarborough, Harrogate, Selby and Hull. In our group of 6, we played against the other 5 schools, winning 3 games and drawing 2, scoring 13 goals and conceding 5. This meant that we had qualified for the semi-finals which we won 2-1. In the final we played against Sowerby Primary School from Hambleton who we had drawn with in our group game. We ended up victorious, winning 3-1! A massive well done to the squad who performed like the champions that they are. 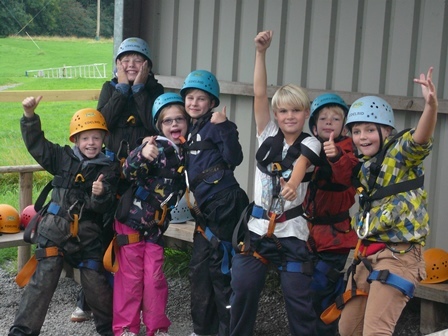 To be winners for the whole of North Yorkshire is a huge achievement for a school who only have 17 children in this year group to choose from. Thank you also to all the mums, dads, brothers and sisters who came along to support the team as your support was invaluable. Here are our Year 4 North Yorkshire Hockey Champions! On Monday our Collective Worship Team delivered worship for the whole school. What was impressive was that they planned, organised and practised this all themselves before delivering it to the whole school! Their theme was our current Christian focus which is Christian journeys. The worship session was well received by all the children who joined in with a quiz and some acting too! On Thursday 28th June our girls' football team took part in a mini-tournament against Westfield Primary School and Clifton Green Primary School. On a sweltering afternoon, the girls performed fantastically well against tough opposition. Though we lost both games by narrow margins, we created several chances to score in both games and improved half by half - very well done girls! On Wednesday we held our annual Sports Day and FOSM BBQ. We overcame a couple of morning and lunchtime showers and the afternoon was another huge success. 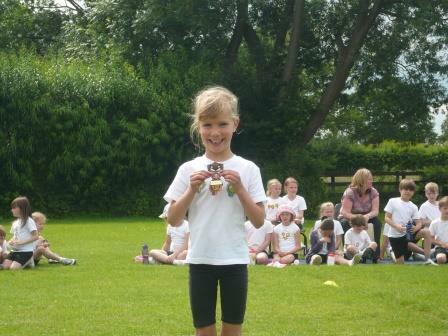 The children participated with skill and determination in their events and showed great sportsmanship throughout. Thank you to all from FOSM in organising the very successful BBQ, and a special thank you to the Bell family for providing the delicious burgers and sausages! Here are some photos of the afternoon. On Wednesday we celebrated the upcoming wedding of our very own Miss Kilvington-Wray with a special assembly where the children and staff presented her with cards and gifts. Over half-term Miss Kilvington-Wray will be marrying her fiance Matt and will become the new Mrs Godbolt. We wish her a fabulous and beautiful wedding day and much love and happiness together as a family. Here are some photos of the assembly. On Friday 18th May, in celebration of the royal wedding between Prince Harry and Meghan Markle, we celebrated by making flags and banners in the classrooms whilst learning about the royal family. The highlight of the day was our celebration lunch which included coronation chicken wraps, sausage rolls and scones amongst other treats and delights. 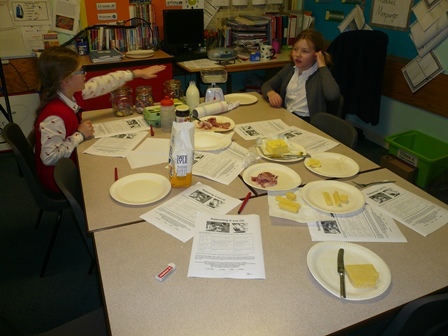 Here are some photos of the children enjoying the food. On Tuesday, our collective worship was led by ordinand Kath McBride. On Tuesday 1st May Reverend Martin Otter led our church collective worship, in which he showed our children the range of different religious clothing that he has to wear to perform his duties throughout the year. Some of the children were lucky enough to be chosen to try on the clothing, in which they looked most splendid! Here are some photos from the collective worship. 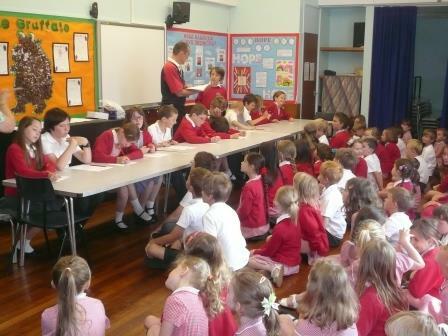 On Monday 30th April, the School Council led a whole-school assembly on Debugging. The assembly was one that we hold each year to teach the children the difference between bullying and if someone is 'bugging' you, along with strategies that the children can use to counter the actions of anyone bugging them in school or out of school. 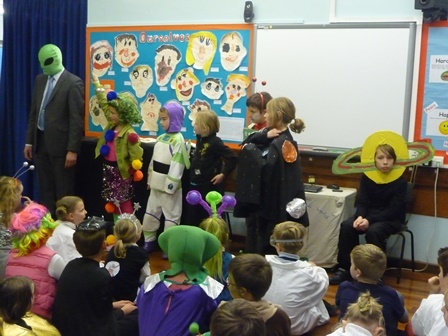 Here are some photos of the assembly being expertly led by our School Council. On Friday 20th April we held our annual Music Concert at Askham Bryan College. We were treated to many excellent performances from groups and individuals including Jazzies, Jazz Hands, drumming, recorders and other instrumental solos and duets. Here are some pictures from the evening. On Wednesday 11th April, Rachael Hildreth came in to school to promote All Stars Cricket to our Key Stage 1 children. 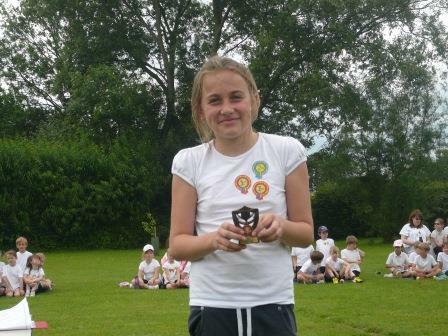 She ran sessions for the children who had great fun whacking balls all round our playground! Hopefully we have the next Joe Root or Lauren Winfield in our ranks! On the last day of the spring term we held our annual Easter Service at St. Mary's Church in the village. The children performed several songs and celebrated the Easter story. Thank you to all our parents and families who were able to join with us in the service. 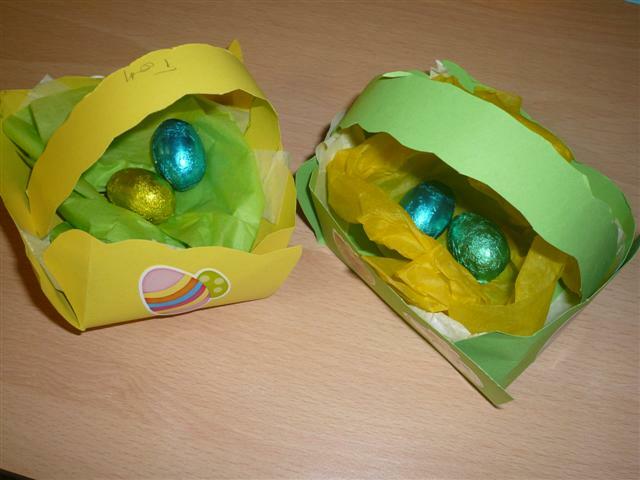 On Tuesday we held our annual Easter Egg Competition in school. 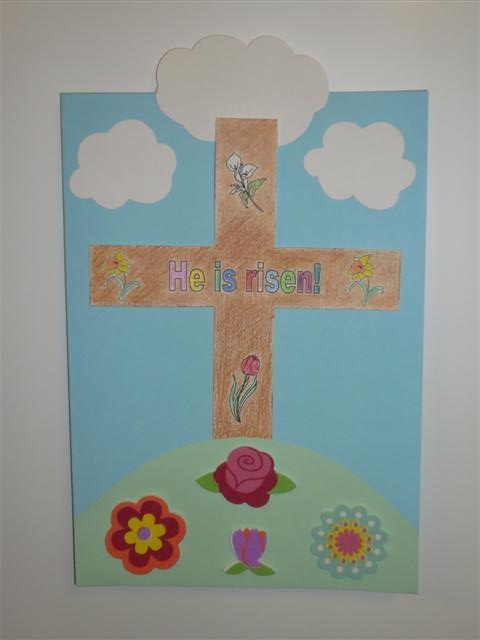 The children were asked to create an Easter picture or design depending on their age. So much hard work and effort must have gone in to the fabulous creations that the children made, so a big well done to all the children that entered. A special well done to our winners this year who are pictured below. On Monday 19th March a group of our Year 6 children participated in the annual Peter Feasby Hockey Tournament at York University. On a bitterly cold evening, the group performed with great skill and attitude, supporting each other well as a team throughout. We ended up winning 2 games and losing 2 games, scoring 7 goals in total. A very big well done for representing St. Mary's with great pride and passion! 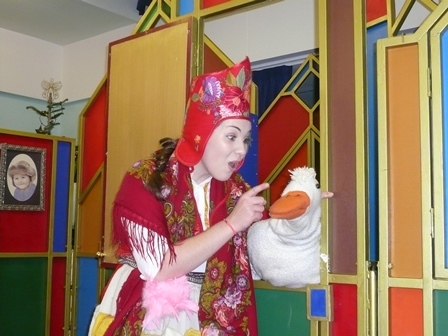 On Thursday 15th March, YoYo came to visit our pupils to run their 'It's Your Easter' workshops with the children. They also led our collective worship on the theme of Easter. 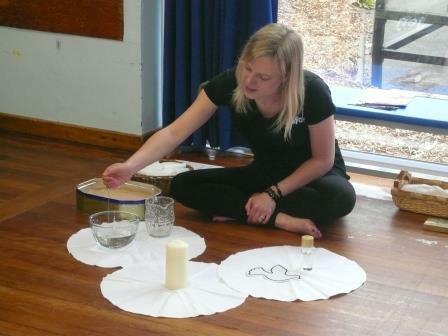 The children always enjoy the interactive YoYo worships and thought-provoking workshops. 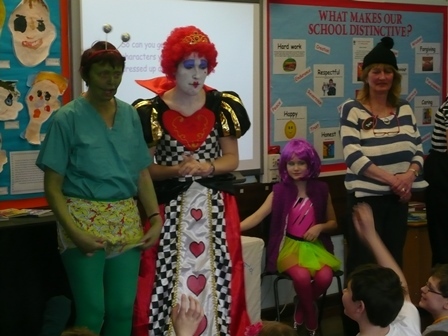 On Thursday we celebrated World Book Day in our usual St Mary's style! The children (and staff!) love coming to school dressed as one of their favourite book characters. Can you spot any characters that you know? On Wednesday we had our next Open the Book collective worship. Ann Watson, our local church reader led the worship with the support of a group of our Year 6 children. 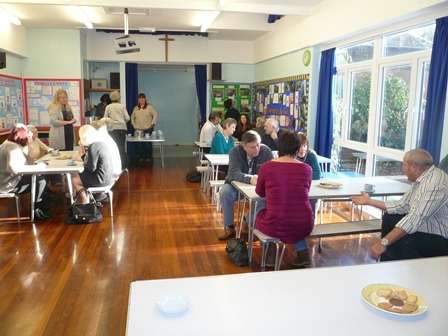 Thank you to all our Year 2 and Year 6 parents who attended the SATs Evening on Tuesday 6th March. We hope that you found it useful in support of your children. On February 26th, our PCWT carried out another whole-school collective worship. They planned, created and led the worship around our current Christian value focus of Love, basing it on the story of Zacchaeus the tax collector followed by a quiz for the children. The team were excellent at putting across their view about loving everybody, which was gratefully received by the children. Here are some photos of the collective worship. 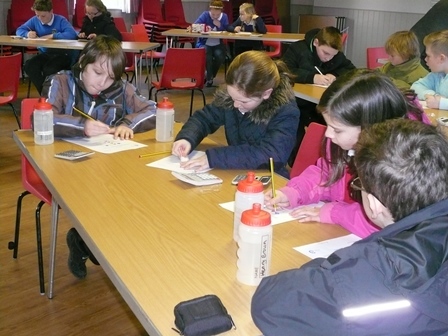 On Friday 23rd February, we had around 80 budding bingo enthusiasts take part in our annual FOSM Bingo Night! It was great fun listening to all the bingo calls and we were all 'eyes down' and very keen to complete a 'Full House'! The older children were fantastic at supporting the younger children throughout the event. We had five lucky winners and they are all pictured here with their prizes. Thank you to our FOSM for organising and running the event and for all the parent helpers who kindly donated their time to join in with the fun and games. On Thursday 8th February, we were visited by YoYo who led collective worship entitled 'It's Your Bible'. The collective worship focussed on the whole story of the bible, fit into 20 minutes - an impressive achievement! 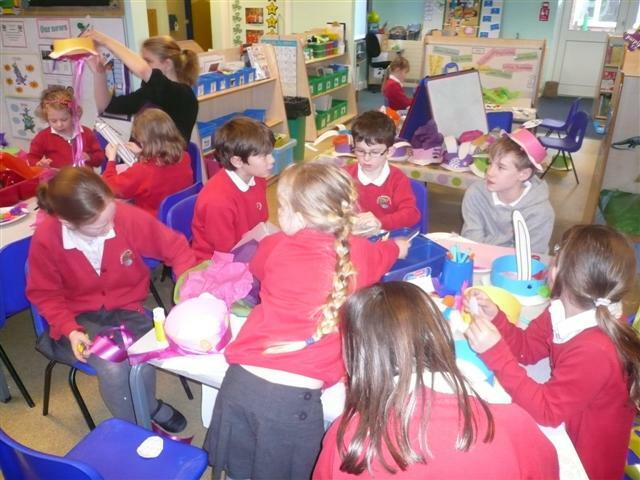 YoYo have also been working with Class 4 over the past 3 weeks on the same theme. Here are some pictures of the collective worship with us all joining in. 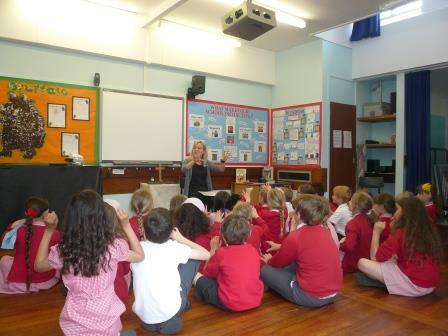 On Monday 29th January, we welcomed Ann Watson in to school to lead our next Open the Book collective worship. She and her team of Year 6 children presented and acted out the story of God's care for Elijah and the widow of Zarephath to the school. Last night we held our annual Maths Parent Workshop which focussed on telling the time and the related vocabulary and facts that the children need to know in each year. We hope that it was a useful for parents in supporting their children outside of school. At the end of term we said farewell and thank you to Mrs Marian Wakeley who has worked at St Mary's for over 28 years. In fulfilling her role as Midday Supervisor for all those years, she has supported and cared for around 2,800 children! Mrs Wakeley is continuing to work at Out of School Club and has promised to pop in to see us, as she will always remain one of our St Mary's family. Thank you Mrs Wakeley for all your hard work in caring for our children, you will be greatly missed but we hope that you enjoy your semi-retirement! 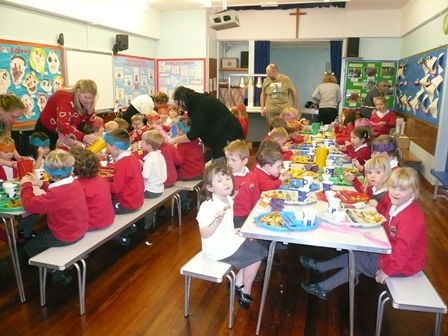 In the last week of term, on Wednesday 20th December, we all enjoyed our school Christmas lunch. Mrs Kath Speed and Mrs Sandra Hayes worked flat out to cook around 130 Christmas lunches, which is a lot of sprouts! The lunches were delicious and we enjoyed them with crackers, hats, toys and several bad jokes! Here we are enjoying our food. On Tuesday 19th December we held our annual Carols around the Tree. Locals from the village and neighbouring villages were invited in to school to listen to our children sing Christmas carols and songs from our nativity. The children made cards and decorations to give out to our visitors who enjoyed the afternoon's singing. 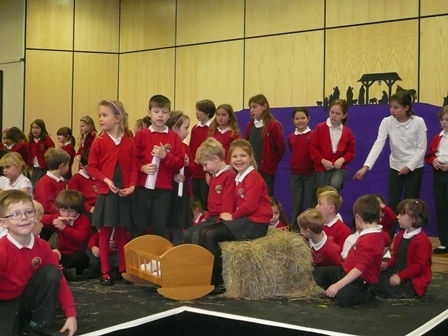 We held our Christmas Nativity on Wednesday 13th December at Askham Bryan College. 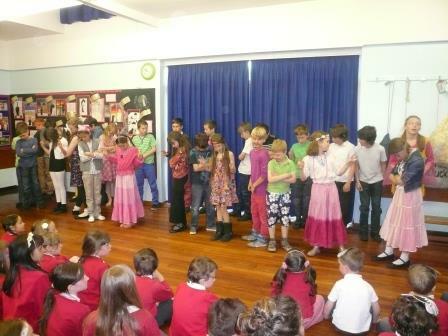 This year's performance was entitled 'Strictly St Mary's' and was based upon a Strictly Come Dancing theme. All the children were amazing in their many different roles, acting, dancing and singing so well on the big stage. Thank you to all our parents who helped with costumes and outfits. Thank you to our FOSM who served mulled wine and mince pies, kindly made by our school cooks, Kath Speed and Sandra Hayes. I and the members of staff have received so many positive comments about the nativity which we have passed on to all the children, thank you. Well done to Mrs Beighton and all our staff for organising and putting on such a great show. 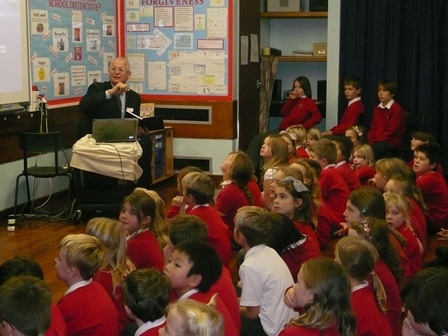 On Wednesday 6th December we welcomed many of our grandparents for our our much-loved Grandparents' Day. This annual event is looked forward to and enjoyed by many. It was lovely to see the numerous grandparents who were able to attend. Despite there being plenty of glue and glitter around, much fun was had, as you can tell from the pictures below! We held our inaugural Grammar, Punctuation and Spelling Parent Workshop on Thursday 30th November. The session was well-attended by parents and children who were able to find out about what is covered and how we cover it in Key Stage 1 and Key Stage 2. 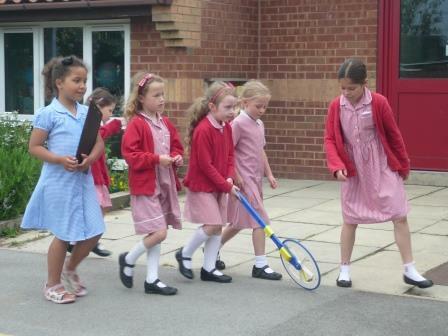 All the classes enjoyed a tennis session put on by one of our local tennis coaches on Tuesday 28th November. We certainly have a few budding Johanna Kontas and Andy Murrays here at school! On Monday 27th November, our Pupil Collective Worship Team undertook their first ever collective worship for the the whole school. The team were chosen by their peers and successfully planned, led and evaluated the collective worship session. Their theme was justice, our current Christian value focus, so they chose to perform and discuss the story of The Good Samaritan. On Thursday 23rd November, we took part in the Quad Kids Competition at Energise. Our team enjoyed the activities which included running, jumping and throwing. We are very proud of all our team for being such brilliant sports stars! On Tuesday 21st November, our KS2 children walked up to St. Mary's Church for our Collective Worship. Ann Watson kindly led the session which was based on justice, our current Christian value focus. As part of UK Parliament Week, we invited Julian Sturdy, our local Member of Parliament, in to school. Mr Sturdy spoke to all the children about what his job as an MP entails and the children got to ask questions which they had planned beforehand. Here are some photos from the talks. On Friday 17th November we joined in with Children in Need. 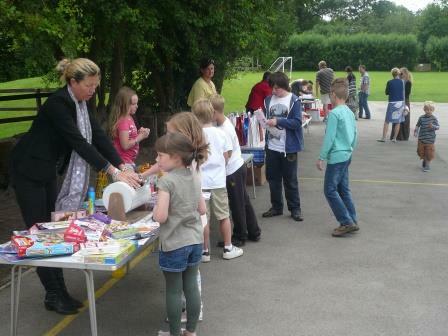 The School Council planned and ran the day, with a cake stall at breaktime and children dressing up in spotty clothing. We raised a mighty £213.04 from the donations brought in by the children - thank you for your generosity towards those people who are in difficulty. Huge congratulations to our Year 2 and Year 4 hockey teams who represented the school on Tuesday 14th November. Our Year 2 team performed superbly to finish as runners up in their competition. Our Year 4 team went one step better and won! They will be performing at the North Yorkshire Games later on in the year & possibly even representing Great Britain in the future! Very well done to both teams for being such impressive representatives of our school. As part of Anti-Bullying Week in November, we were visited by Stacey who ran 'Blast Off Anti-Bullying' for Key Stage 1 and ''Stop! Think! Words can hurt!' workshops for Key Stage 2. Here are some photos of the sessions. As part of our Remembrance Day commemorations we have been selling poppies in school to raise money for the Royal British Legion. I am pleased to announce that we raised £95.12, so thank you for all your kind and generous donations. This money will go towards Service people, veterans and their families. On Friday after school, our FOSM held their annual Film Night. We all had a great time watching Mr Peabody & Sherman whilst enjoying popcorn and juice. Here we all are snuggled up in our blankets, duvets & sleeping bags! On Thursday 9th November, York City Football Club Foundation ran their Healthy Body, Healthy Mind Workshops in school. 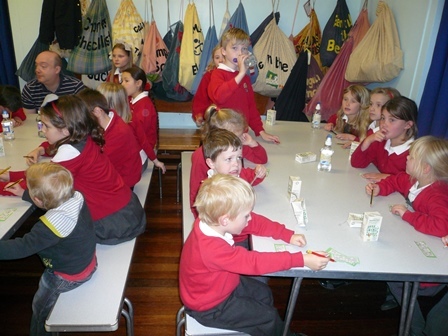 The children learned about different healthy foods and activities that help keep them healthy. They were also given pedometers which were then tested out too! Following another successful Invictus Games, Mr Wiseman came to speak to our children on Friday 20th October about his medal winning feats at the Toronto games at the end of September. Here he added 5 more medals to his overall tally - a gold, two silvers and two bronzes! Mr Wiseman spoke to the children about going for goals, never giving up and showing resilience when things are difficult. Mr Wiseman is a true sporting hero that we can all look up to. On Friday 13th October we celebrated Harvest with our annual Harvest service at St Mary's Church in the village. Children from years 2, 4, 5 and 6 contributed to the service by reading different parts and all the children enjoyed the Harvest songs. As always we were well supported by our parents and families. Thank you to everyone who kindly donated food for Carecent York, who have written to the school to say a big thank you for your generosity. Last night our Year 5/6s competed in the High 5 Netball Competition at Manor CE Academy. Our team of enthusiastic individuals enjoyed the competitive matches and performed with real determination and skill. Though we found ourselves up against more experienced teams, we showed great resilience and learned much from the games. Well done to you all and thank you to the mass of supporters who came to cheer us on! 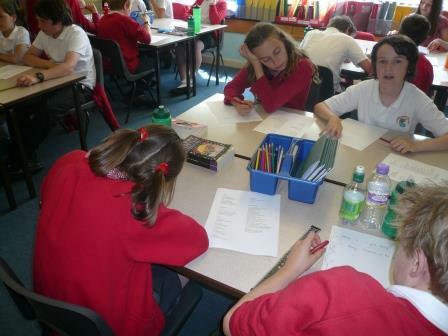 Last term, our Year 5s entered the Tockwith Show Poetry Writing Competition. Entries had to be based around the theme of the 'The Best of Yorkshire'. We are delighted that Abby was crowned the overall winner of the competition, which is open to all Year 5 children in Yorkshire! Here is Abby with her impressive trophy. Huge congratulations Abby! 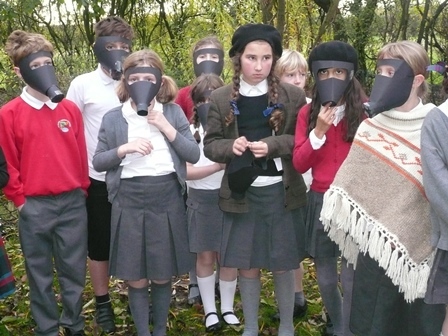 Last week our children went on their Class Four fieldweek at Winmarleigh Hall. 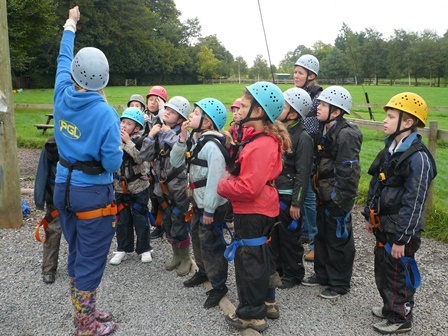 The children had a great time zooming down zip wires, scaling climbing walls, swinging on the Giant Swing and building rafts - then falling off them and getting wet! 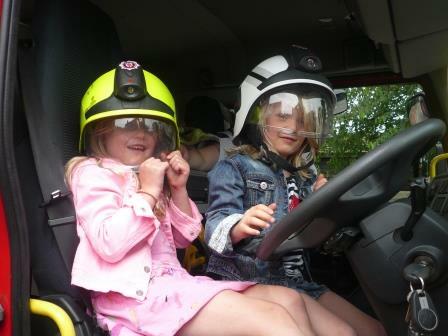 There were many positive comments from the instructors about how polite and well-behaved the children were. They were, and are, a real credit to the school and you their parents. We hope you enjoy the pictures of some of the activities that they got up to. A very warm welcome to all our new children joining us in Reception this year. We wish you all a fantastic and happy time here as part of the St. Mary's family. 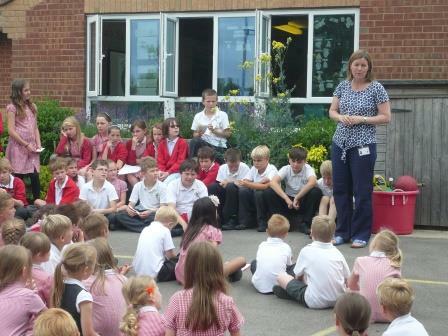 On Friday 21st July we held an emotional Leaving Assembly for our Year Sixes. All the children within the year group have developed as learners and as individuals during their time here at St Mary's and they deserve every success that they will undoubtebly achieve. We will miss them all greatly, however, as part of the St Mary's family, you are always more than welcome back here to see us at anytime. A big thank you to our Leavers and their families for purchasing new netball posts for the school, which will get plenty of use by many children. To say a big thank you to Reverend Roy Shaw on his retirement, we held a special Leaving Worship and lunch for him on Thursday 20th July. A big thank you to Mrs Speed and Mrs Hayes, our school catering staff, for providing a delicious summer picnic feast for Roy and us all to enjoy. Roy has been a member of our St Mary's family for 9 years and has supported our children, our families, our staff and our school on many, many occasions. We will miss his kind-hearted and supportive nature, along with the visits from his pet sheep Barbara! We wish Roy a long and happy retirement and we hope to see him visit us before long. On Tuesday 18th July we held our annual Times Table Tussle competition to celebrate mathematical success and specifically the learning of times tables. 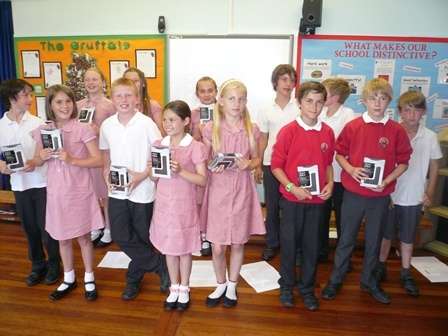 Winners were presented with some mathematical equipment. Here are the winners from each year group. On Sunday 16th July we took two teams to Bootham Crescent to play in the York Knights Touch rugby Tournament. It was a sunny afternoon that was well-attended by children and parents. We managed to win, draw & lose some games but the teams learned from one game to the next and enjoyed playing at Bootham Crescent. On Thursday 13th July we held our much-loved annual Big Sing Challenge Cup. The songs this year were taken from the musical Les Miserables and the children enjoyed rehearsing, dressing up and performing their class songs. It was lovely to see Mrs Ellis, who along with Miss Buckley from Tadcaster Grammar School, helped to judge the competition. This year's winning song was sung by Class Two - very well done and we look forward to next year's competition! On Tuesday 11th July we held our annual Sports' Celebration Evening to celebrate all the children who have represented St Mary's this year in sporting competition. An impressive 73% of our children were involved in sports clubs or competitive fixtures this year, many of whom were here tonight to collect their medals. The medals were kindly presented by Mrs Inger Russon, our governor with responsibility for Physical Education. 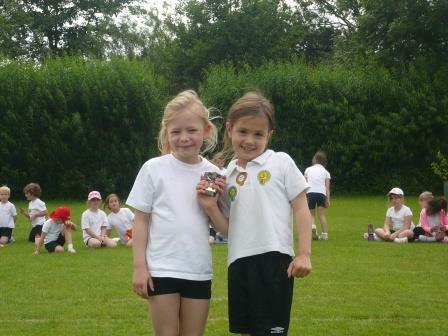 Here are some photos of our budding sports stars! 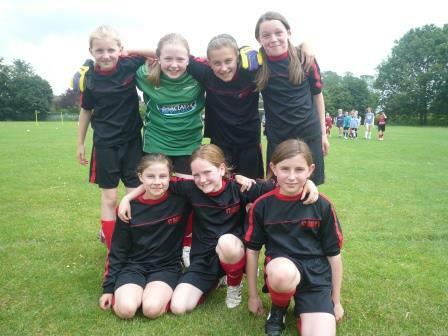 On Monday 3rd July, our Girls' Football team took on Westfield Primary Community School. The team performed with great energy, enthusiasm and skill but were defeated 3-1. Despite going behind, the girls never gave up and fought hard until the final whistle - a good team effort to be proud of! We took our Pupil Collective Worship Team to the inaugural Pupil Collective Worship Conference on Tuesday 27th June, which took place in Bishopthorpe. The children looked at different ways of leading collective worship in school and will be using these ideas next year to plan and lead collective worship at St Mary's. During our Healthy Schools' Week, we had Junior visit us to run the Prokick Challenge. 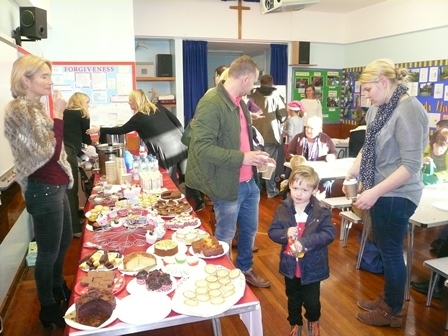 The children were asked to raise sponsorship money for children facing life-threatening illnesses, to help children living in poverty and to help develop positive futures for disadvantaged children in the UK and abroad, plus for our school too. On the day of the Prokick Challenge, all our children took penalties into a huge inflatable goal and had the speed of them measured. Medals were presented to the fastest penalties from boys and girls in each year group and footballs were presented to children who had raised a certain amount. The children enjoyed the challenge and Junior was great at encouraging the children to support and praise each other. Here are some photos of the challenge. 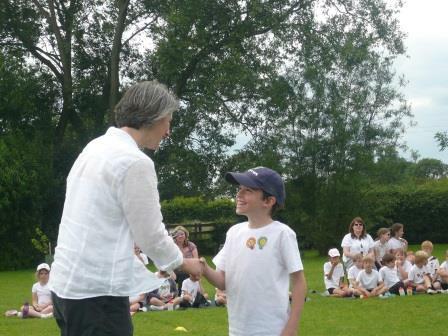 On the afternoon of Wednesday21st June, we were blessed with more good weather for our annual Sports Day. The children took part in a sprint, an obstacle race and the egg and spoon race. The children were also split into countries and Argentina were the winning country this year. It was lovely to see so many family and friends joining us for the day, which also included our FOSM BBQ, which proved very popular again this year. Here are photos of the winning boys and girls from each year. On the morning of our Sports Day, on Wednesday 21st June, Mr Wiseman came in to school to talk to the children about sport and always doing your best, no matter how hard some things might be. Mr Wiseman has represented Great Britain twice in the Invictus Games, captaining the British team in 2016. We were very lucky that he was able to bring in all his medals that he has won in swimming and rowing. 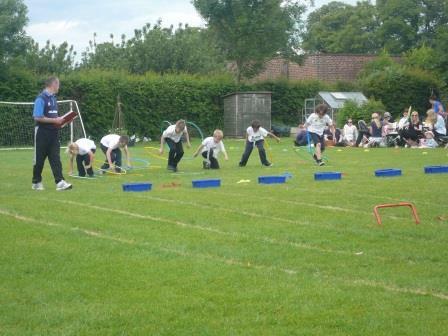 The children were then inspired to do their best later that afternoon in our annual Sports Day. On Tuesday 23rd May, Mrs Holliday took 26 of our Year One and Year Two pupils to York High School to participate in the Cross Country event. We have never taken so many children to a sporting event before, so a huge well done to all the children who chose to participate. After a fun warm-up led by elder pupils, the children took part in the main event. Mrs Holliday said that she was impressed with everyone for trying their best and enjoying the run. Well done to you all! During the Autumn term, our PE Specialist, Mr Herschell-Smith trained ten of our Year Sixes as Playleaders. 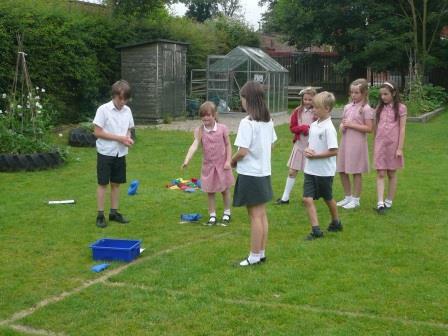 The Playleaders learned about how to organise and run different games and activities, plus how to lead other children. During the Spring term, the Playleaders then led active sessions for groups of children during lunchtimes each day. A big thank you to all the Playleaders - I know that the children who participated in your games had great fun! 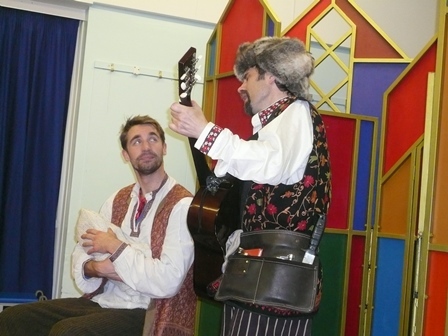 On Tuesday 4th April we were very lucky to have a visit from Freddy Fit. Each class spent an energetic session dancing, jumping, spinning, balancing and hula-hooping! Have a look below at the great fun that we all had. On Monday 3rd April we held our annual Easter Egg Competition. Thank you to Mr Peter Cannings (Chair of Governors) and Mrs Baldwin (local reisdent) who judged the entries again this year - a difficult task indeed! Have a look at the entries and winners below. On Friday 31st March we hosted our annual Music Concert at Askham Bryan College. The children produced many superb performances throughout the evening including Jazzies, Jazz Hands, drumming, violin, recorders, choir, brass and keyboards. A huge thank you to all staff and adults who have supported the children in learning these instruments. Thank you to all the parents who attended the KS1 and KS2 SATs Evening on Tuesday 14th March. We hope that you gleaned some useful information to support your children in the lead up to their tests. 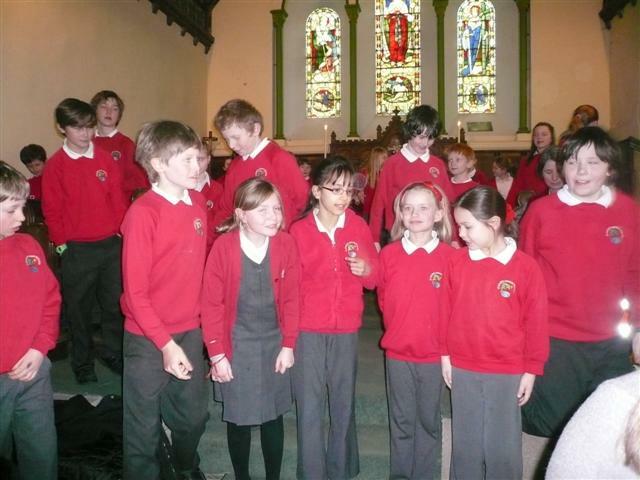 On Tuesday 14th March, KS2 undertook their Collective Worship at St. Mary's Church in the village. The worship was led by Reverend Roy Shaw. The children were all able to choose whether they would like to be blessed individually by Reverend Shaw. 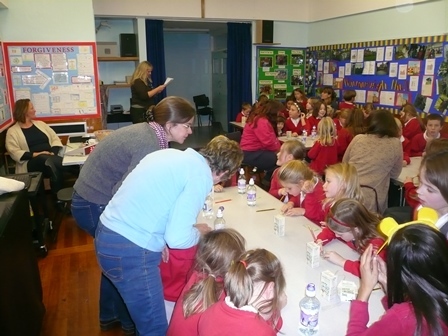 On Friday 10th March, FOSM hosted a Bingo Night for the children in school. Much fun was had by all and the elder children were great in supporting the younger children and Mr Jones! Here are some photos of the event along with our winners. On Tuesday 7th March we took a Year 6 Hockey squad to take part in the annual Peter Feasby Hockey Tournament at Energise, which is run in memory of Peter Feasby, who was a Headteacher in York. Our team performed very well against some larger schools, winning, drawing and losing some games. What impressed me most was that our squad were happy to help out another school who didn't have enough players - well done for showing true sportsmanship. 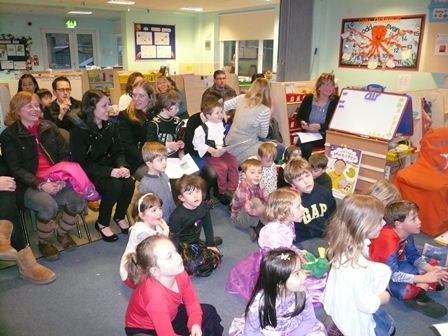 Following World Book Day, we held a Reading Workshop for parents after school. Mrs Boast discussed with parents the phonic program and teaching that we use with children and demonstrated some of the techniques and resources that we use to help develop children's early reading. The workshop was well attended by parents - thank you for the support that you give to your children. On Thursday 2nd March we celebrated World Book Day by asking children to come dressed as one of their favourite book characters. Can you tell what the children have come dressed as? Can you find yourself in amongst the fantastic outfits?! In February, we were very fortunate to have Mrs. Cooper visit us here at St. Mary's. Mrs. Cooper was a longstanding member of staff here, including time as Acting Headteacher. When she left the school, she very kindly gave us the 'Mrs. Cooper's Award'. This is given out at the end of every half-term to a pupil who has stood out for their personal and academic qualities. We also link the award to our Christian value for that half-term. Mrs. Cooper presented the award to Luke. On Tuesday 17th January, 2017, we held our annual Maths Evening in school. Many parents and children came into school to see and practise the different mental maths strategies that we teach the children at different ages. This is our current Maths focus for the academic year. Thank you to the parents and children who attended, and to the members of staff who planned and delivered the successful evening. On Tuesday 10th January, 2017, Class 4 participated in this year's Young Voices. 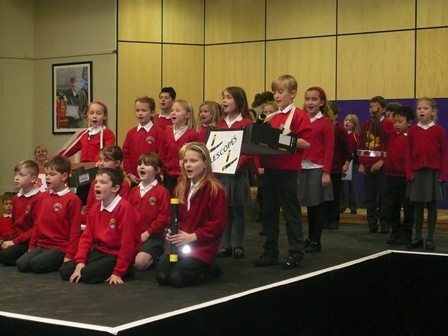 In the afternoon they headed down to Sheffield Arena to join around 8,000 other primary school children as part of the Young Voices choir. After practising their songs together, they put on an amazing performance for all the parents and family members who had travelled to watch. Our children were a real credit to themselves, their families and their school. They had great fun singing and dancing the evening away and enjoyed the performances from a range of different professionals too. A huge thank you to Mrs Beighton, Mrs Gee, Mrs Goudge and our parent helpers for making the day such a special one for our children. Thank you also to our Friends of St Mary's for buying the t-shirts in which the children performed in. Here are some pictures of the evening. There will be a Staff Training Day on Wednesday 4th January, 2017. School will reopen to children for the start of the Spring term on Thursday 5th January, 2017. On the last day of term, the children were able to wear a Christmas jumper to school, to raise money for Save the Children. The children donated a total of £92.69 towards the charity, which goes towards saving the lives of children around the world through the provision of healthcare, education, protection and food. It was great to see so many children (and staff!) joining in and raising even more money for charitable causes - well done one and all! On Tuesday 13th December we invited several of our local residents from Askham Richard and nearby villages to our annual Carols around the Tree. During the service the children sang songs from our nativity, along with traditional carols too. Class One had made Christmas cards and Class Four had made biscuits for our guests. Reverend Roy Shaw blessed our guests and Reverend Geoff Mumford gave a Christmas message. Thank you to FOSM for serving drinks and mince pies. The Christmas Nativity was a resounding success and very much enjoyed by us all. The children were all excellent and I’m sure that those of you who were fortunate enough to see it, will all be humming the songs for the next couple of weeks! Thank you to all the staff, parents, FOSM and children for your hard-work which resulted in such a lovely evening. Here are some snaps of the production. Thank you to FOSM for all the hard work in organising our annual Christmas Fair, and to the Key Stage Two children for making their fun games for us all. 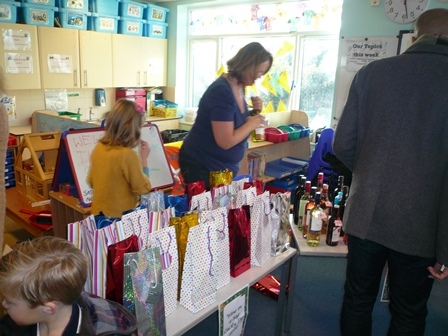 Many thanks too for all the support from our parents, families and friends who supported in providing donations, raffle prizes and joining us for the afternoon. We raised approximately a whopping £1350 and the funds will go towards providing more resources in school for the children. A great time was had by one and all, and the children especially enjoyed the games and visit from Father Christmas! I think that us adults enjoyed the turkey sandwiches and cakes too! What a tremendous effort and thank you to everyone for their generous donations and time in helping run the stalls and clearing up at the end. This year, we took part in Operation Christmas Child again. This is where we ask the children to pack and wrap a shoe box full of toys for either a boy or a girl who will not be fortunate enough to receive any presents this Christmas. These shoe boxes are then taken by the charity Samaritan's Purse and delivered to children in need around the world. This year we managed to fill a whole boot full of these shoe box parcels! Thank you to all the children and families who donated toys and gifts to support children around the world. 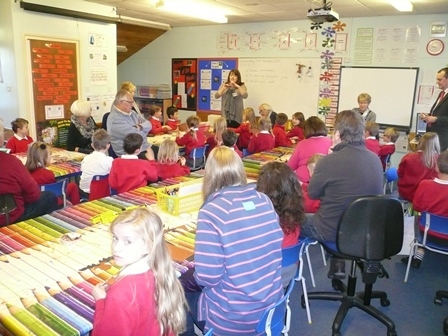 On the morning of Wednesday 16th November, we welcomed the grandparents of our children in to St. Mary's. 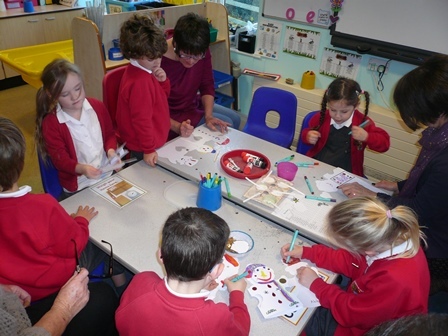 Throughout the morning the grandparents worked with their grandchildren and other children making Christmas decorations, which now adorn our school Christmas tree. Many thanks to all the grandparents who could attend on this lovely morning. On Tuesday 15th November we celebrated Children in Need in school. The theme of the day was 'Opposites' so we saw many children dressing up as their mums or dads, and we even had some dressed up as Mr Jones! The day was orgamised by the School Council and they also made and brought in cakes for children to buy and enjoy during morning break. Overall, the children raised an impressive £220.53. In addition to this, Friends of St. Mary's hosted a film night on Friday 11th November, which raised a further £81 for Children in Need, making a grand total of £301.53! Here are some photos from the day. 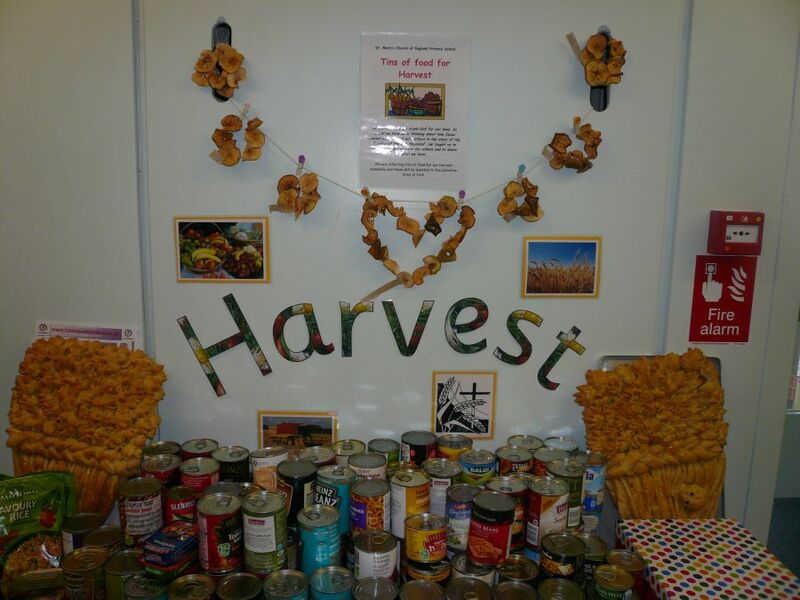 On Friday 7th October we celebrated Harvest with our annual service at St. Mary's Church. The children impressed us all with their beautiful singing and it was lovely to hear so many young confident speakers during the service. It was great to see the many parents, grandparents, family and friends who joined with us during our service. You were all very generous in your donations at the end and you managed to raise £98.76 which will be split between St. Mary's Church and Christian Aid. We are also very thankful for all the kind donations of tins of food, which have been given to York Food Bank. Thank you to everyone who came to support our Sports Day. The children were grouped into countries in recognition of this years Olympic Games and trophies awarded for the overall girl and boy winners in each year group. A huge thank you to Mr Jones and Playleaders for organising and running the event, and Friends of St. Mary's for the fabulous BBQ which followed. Well done to our Football Team for their superb performance in the Champions League Tournament held on Saturday 18th June 2016. Thank you to Mr Reilly for stepping in to coach and oversee the team, all the parent and children supporters and everyone who came to wish the children well. We were presented with the League H winners trophy and this will take pride of place in the entrance. On Thursday 16th June we showed our support for our National Football Team in coming to school in football shirts and watching part of their game. St. Mary's are part of a ISSP project for maths in which we work alongside other State and Private Schools in York. On Tuesday 14th June we investigated patterns and patterns of numbers. On Thursday 9th June we had a very special day in honour of our Queen. 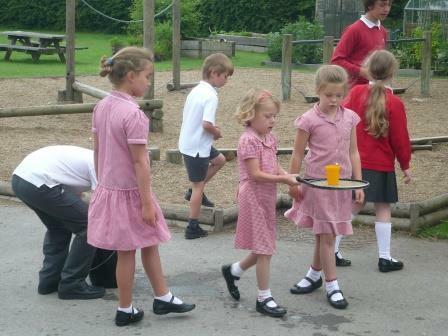 The children enjoyed special activities during the day and the school cook prepared a delicious celebration luncheon. The hall was decorated in bunting and flags, and the children wore their crowns! At the end of the day FOSM; represented by Mrs Harte, presented all the children with a commemorative mug. 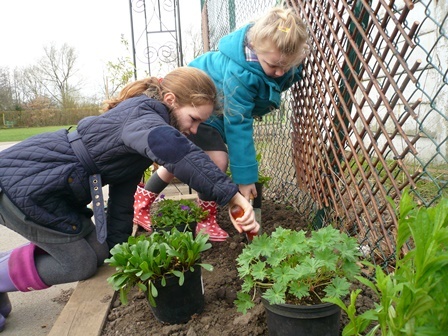 Both Class 1 and Class 2 went to The Grange Garden Centre to find out all about plants and vegetables, and plant up their own seed trays. A big thank you to Mr Woosey and his team for their time and kind donations of plants to all the children. 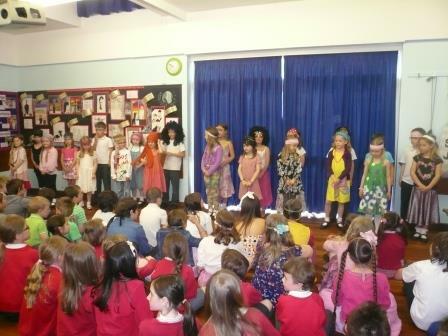 We were treated to a fabulous Talent Show by Class 2 on Thursday 26th May. Well done to all the performers. On Friday 13th May 2016 Class 4 celebrated the end of their SATs with a BBQ in Forest Schools. A very big thank you to Mrs Gee, Mrs Walmsley, Mrs Goudge and Mrs Simpson (Parent Governor) who helped guide the children through the week. The sausages were delicious and the toasted marshmallows yummy! 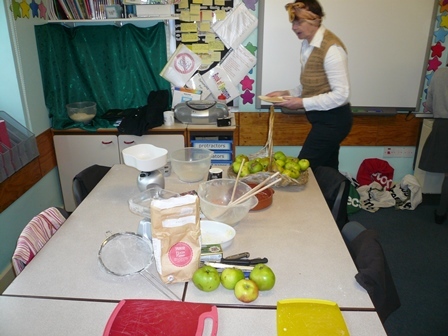 Thank you also to our cook who presented the class with a large cookie to both the Year 5's and Year 6's to enjoy. On Friday 24th April we celebrated our musical talents with an evening of music and dance perfromed by the children at Askham Bryan Conference Hall. They had worked very hard in preparing for the concert and showed great perseverance, concentration, self-discipline coordination and teamwork. All these skills are of great benefit, but most of all they learnt that music is fun, enjoyable and rewarding. Thank you to everyone who was able to join us for our Easter Service at St. Mary's Church on Thursday 24th March. Thank you to Mrs Beighton for the songs and hymns, Mrs Illingowrth for leading the Open the Book Team, and the children for sharing with us their super easter cards and decorations. It has been a very successful season and the whole team have shown great determination, commitment and team work throughout. Our final placement in the City of York Primary Football League H has yet to be confirmed, however, we are hopeful that we have won the cup! As the football season draws to a close, may I thank all parents for their help and support over the season, encouraging the team, providing transport and washing the kit. This has been very much appreciated. Open the Book Team and Mrs Illingworth undertook the service in school and based the theme on 'The Dreadful Day' and the meaning of Good Friday. They are going to perform this as part of the Easter Service in Church on Thursday to parents and our community. 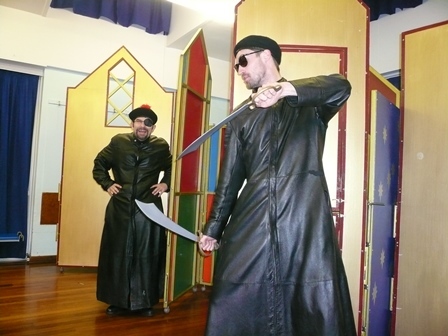 Class 4 presented to the school 'Macbeth' as part of their Literacy project. The performance was fantastic. They started in the morning and performed in the afternoon. This showed great determination, focus and confidence. 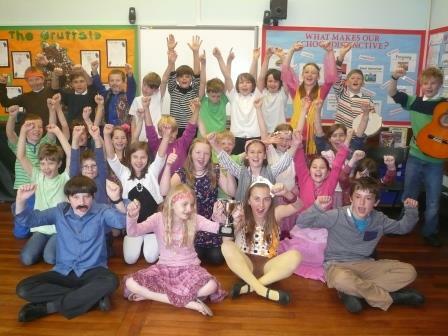 We throughly enjoyed watching the play and Class 4 enjoyed the challenge of a drama production and working as a team. Thank you to Mrs Boast for running a Phonic Workshop, supported by Mrs Gibbs. The evening was well attended as Mrs Boast ran through 'what a phonics lesson looks like' with the help of her class. The session included suggestions for helping children learn to read, websites suitable to support learning at home, and the principles of phonics teaching. 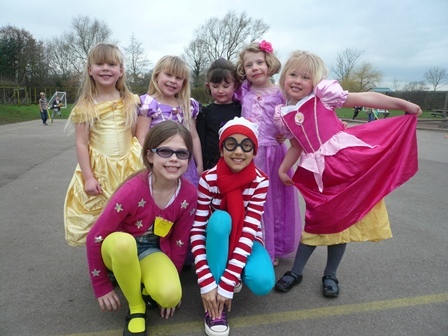 Thank you to the children and parents for the wonderful costumes to help us celebrate 'World Book Day'. Everyone looked amazing! 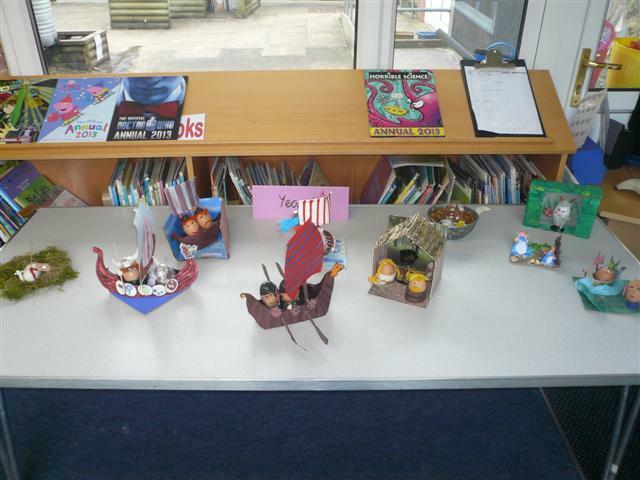 Prizes were awarded to the 'best dressed character' from each year, and Dads and Uncles enjoyed sharing books with us. On Tuesday 2nd February we held our annual Maths Evening for parents and children which outlined the maths strategies used in school for addition and subtraction. Thank you to all the teachers for the superb workshops and in providing information leaflets on how to help with homework. Thank you also to all the parents and children for joining in the fun! Thank you to Mrs Beighton for directing our annual Big Sing Christmas Special! We had a really super time singing and sharing the joy of Christmas. Thank you to our school cook kath and Sandra for our fantastic Christmas dinner. It was delicious and the children and staff throughly enjoyed their special meal. Thank you also to all the adult helpers who made it run so smoothly. Thank you to the Mrs Readman and Mrs Holliday for organising our Carols around the Tree. 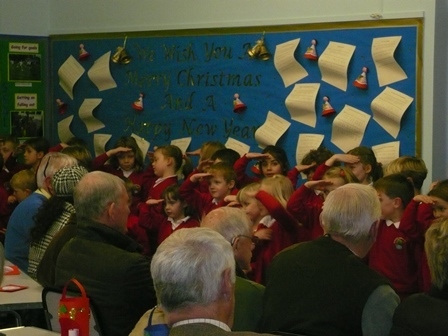 The children performed a range of songs from our Christmas Nativity as well as some more traditional carols. The children enjoyed performing and wished everyone a Happy Chirstmas and handed out cards and plants. It was so lovely to see so many family and friends sharing in our special evening. The children looked amazing, and their performance was spectacular! Thank you to Askham Bryan College for the hall, Friends of St. Mary's for the refreshments, Mrs Readman for all her help, and Mr Gregory for helping us set up the staging. 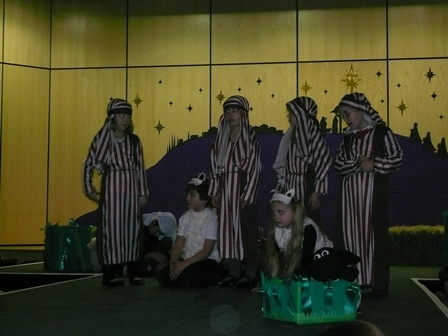 A huge thank you to Mrs Beighton who was the writer, director and producer of this fantastic Nativity celebration. Thank you to FOSM for all the hard work in organising our annual Christmas Fair, and for all your support in providing donations and joining us for the afternoon. We raised approximately 1500 pound and the funds will go towards funding Year 4 Wider Opportunities drumming and English and Maths learning resources.Everyone had a super time, and the children especially enjoyed the games and visit from Father Christmas! What a tremendous effort and thank you to everyone for their generous donations and time in helping run the stalls and clearing up at the end. Congratulations to the KS1 Hockey Team who won the York School Competition! Thank you for the fantastic support from parents and Mrs Beighton for training and accompanying the children. Congratulations to all the contestants who represented the school in the Southbank Cluster Spelling Bee on Tuesday 24th November. We brought home two winning trophies. 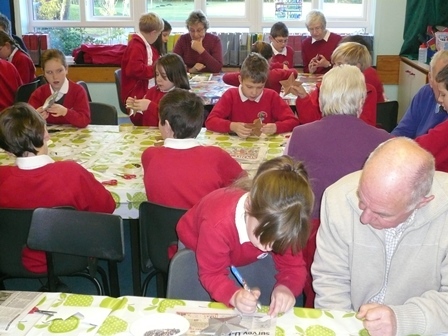 On Wednesday 18th November we had a fantastic morning making Christmas decorations with our Grandparents. Thank you to Mrs Glynis Ashford, Mrs Lindy Illingworth and Mr Hartley for serving refreshments. School Council have raised a fantastic total of 243.22 for Children in Need with their non-uniform day and Book Fair. Thank you for all your donations. Thank you for everyone who purchased their poppy from the 'Poppy Boys and Girls' at school. Each class focussed on Remembrance and upheld two minutes silence at 11.00am. Thank you to FOSM for the super Film Night on Friday 16th October. We had over 88 children stay after school to watch a film in the school hall, enjoy popcorn and just being together. We all had a wonderful time! Thank you to everyone who was able to come and join in our Worship at St. Mary's Church in Askham Richard. We celebrated Harvest with songs, praise and prayers. Thank you also for your generous donations of tins for the York Food Bank and for the collection in Church for Christian Aid and to support our local church. We are delighted to announce that we have been awarded the Quality Mark for the fifth time. This national accreditation is awarded to schools which meet the Quality Mark Standard and will last for three years. It promotes, supports and celebrates progress and improvements made by the school in English and Mathematics. To achieve the Quality Mark the school undergoes an assessment carried out by an external accredited assessor against the 10 elements of the Quality Mark. 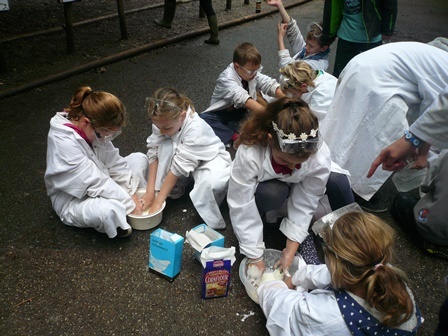 The children in Class 4 had a wonderful week at Winmarleigh Hall for their residential visit. Thank you to Mrs Gee (Group Leader), Mrs Goudge and Mr Jones for accompanying the children. This year, we all enjoyed seeing the daily updates on twitter! On Thursday 16th July the Year 6 children delivered the final assembly to the school. Mr Peter Cannings (Chair of Governors) congratulated them for their hard work and contribution to school over the years and wished them well in the future. 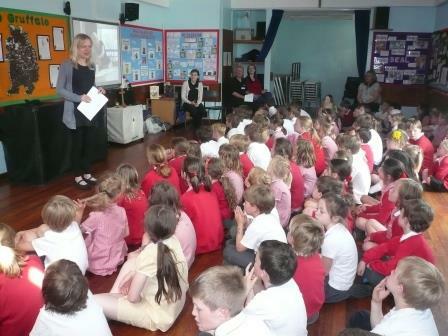 The children were presented with a bible from Mrs Lindy Illingworth (Foundation Governor). Thank you to the parents and children for their generous leaving gift to the school. 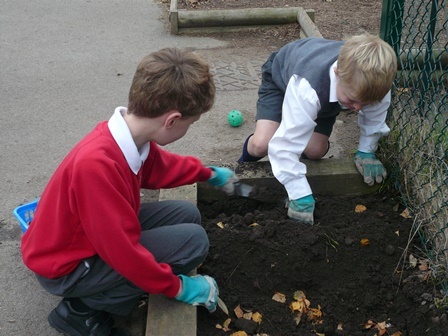 They had worked on a gardening project to create a peaceful area within the school grounds which would attract bees, butterflies and birds. Thank you to Class 2, Mrs Read and Mrs Simspon (School Governor) for the wonderful banner celebrating one of our Core Christian Values: Koinonia. Koinonia is often translated from the Greek as 'fellowship' or 'community'. The central element of being a family is interdependence: all are needed and valued and each person is important to the whole. Read all about Koinonia in the Bible in Acts 2:42-47 and see how the early Christians worked and lived together. On Thursday 2nd July we hosted our annual Big Sing Challenge Cup where each class enters a song for a singing competition. Thank you to Mrs Beighton for organising the event and Miss Buckley from Tadcaster Grammar School for judging the competition. All the performances were amazing and congratulations to Class 2 for their winning performance. We would like to say a huge thank you for all the donations that we collected on Friday 26th June for Vasculitis UK. We thank Year 6 for helping marshal the Fun Run and a huge thank you to Mr Motivator (Patrick) who encouraged all the children to keep going and altogether he ran a whopping 12 laps of the course! All the children had an amazing day running our cross country course set out by Rebecca and Mair, drinking water at the refreshment stands, and finally finishing off with a sticker, a bottle of water, piece of fruit and we can't forget the ice pops! We could not have done this without the help of Mrs Hornsby, parent helpers and the kind donations from ISS, Tesco and Angel Springs. We are delighted to announce that the grand total was 200 pound. Written by: Aoife, Erica and Maisy. Thank you to everyone who was able to stay and join us for our annual BBQ following sports day. The food was delicious and the children enjoyed the stalls, games and especially having Mr Jones in the stocks! A special thank you to Lee and Deb Bell for providing the meat and to all the parents who helped on stalls and/or organise everything. It was very much a team effort. The total amount raised this year is 820.19 which will go towards some of the educational equipment the school requires. Thank you to everyone for a fantastic sports afternoon. The weather was perfect and the children had a super time. It was lovely to see our new Reception children and parents joining us for the afternoon. The children had a fantastic week learning about how to keep healthy from a variety of visitors including: the Police, Tescos, and Sun Safe. Thank you to all of the staff for making the week so successful. On Monday 22nd June Year 5 children participated in Tadcaster Grammar School Enterprise Day at York University. 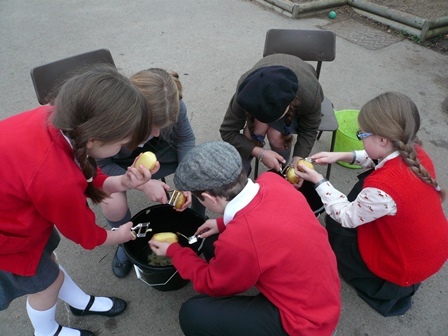 The children worked with other feeder schools and Year 9 students from Tadcaster Grammar. The 'Chocolate Challenge' included key enterprise concepts such as, branding, marketing, finance, and social responsibility. The children presented their products and adverts at the end of the day to the rest of the groups. Thank you to Mrs Elgie and the children in Class 4 for the wonderful banner based on the stained glass window in our church in Askham Richard. This is now displayed in our cloakroom area. Look out for the special window next time you are in St. Mary's Church! Our Open the Book Team 2, along with Mrs Illingworth (Foundation Governor) led our Collective Worship on Tuesday 16th June 2015. The service was based on 'Jesus healing the sick' and re-told the bible story of Jesus healing the man who was lowered through the roof. Mrs Goodwin and Class 3 have been sewing a banner on the Christian value of hope and this was presented to the school on Tuesday 16th June. A huge thank you to Mrs Goodwin for the wonderful banner which is displayed in the KS2 IT area. On Friday 12th June, Friends of St. Mary's (FOSM) organised a 'Games Evening' for the children. There was a scavenger hunt followed by a balloon chair making competition. Refreshments and ice pops were served. Thank you to all the helpers and FOSM for organising this exciting event as all the children had a super time! 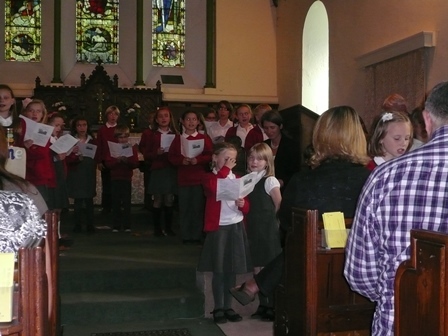 On Tuesday 19th May, Key Stage Two children participated in Collective Worship at St. Mary's Church. The service focussed on Pentecost. The Rev Roy Shaw explained about Pentecost being the festival when Christians celebrate the gift of the Holy Spirit. It is celebrated on the Sunday 50 days after Easter.Pentecost is regarded as the birthday of the Christian church, and the start of the church's mission to the world. The Holy Spirit is the third part of the Trinity of Father, Son, and Holy Spirit - that is the way Christians understand God. Pentecost is a happy festival. Ministers in church often wear robes with red in the design as a symbol of the flames in which the Holy Spirit came to earth. Acts Chapter 2: Verse 17-18 In the last days, God says, 'I will pour out my Spirit on all people. Your sons and daughters will prophesy, your young men will see visions, your old men will dream dreams. Even on my servants, both men and women, I will pour out my Spirit in those days, and they will prophesy. Some Year 5 and Year 6 children read out their prayers which were written on a dove.The children sang 'Oh Lord hear my prayer' as they placed the prayers onto the Prayer Tree at the front of the church with our Foundation Governor Mrs Illingworth. 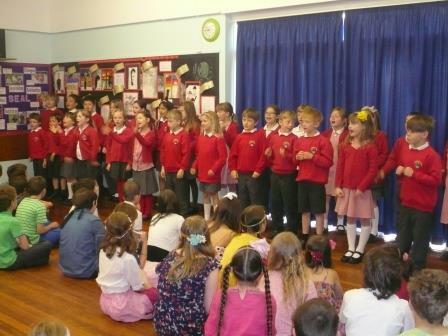 On Tuesday 19th May, the school was highly entertained by the talents of Class 2. This ranged from drumming, dance, singing and magic shows. Congratualtions to all the children who took part, you were amazing! 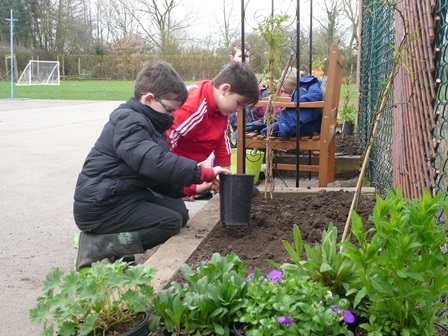 Thank you to everyone who was able to support our Gardening Club with their annual Plant Sale. All proceeds are used to purchase new gardening equipment and seeds. A very special thank you to David and Mrs Gibbs for running the club. 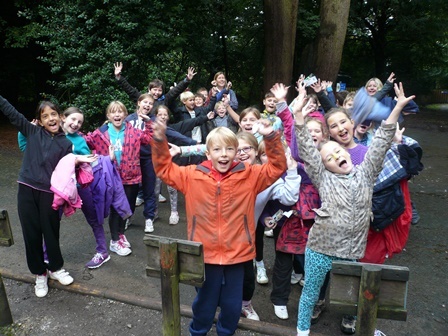 On Friday 15th May 2015, Class 4 children went down into Forest Schools to celebrate the end of the SATs. The cook made Year 5 and Year 6 huge cookies to share and the children were treated to BBQ sausages and marshmallows. Thank you to Mrs Walmsley, Mrs Gee, Mrs Goudge, Mrs Simpson (Parent Govenor) and all the helpers this week. Rev Jon Hartley shared with the children the work of the Christian Charity; World Vision. The visual presentation highlighted the needs of children in Africa and also work undertaken in reponding to world crisis, such as the earthquake in Nepal. As the Rev Jon had travelled all the way from New Zealand, he welcomed and said goodbye in their native tongue. 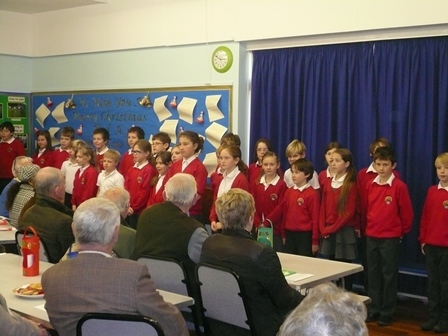 On Friday 24th April we held our Music Concert at Askham Bryan Conference Hall to celebrate St. Mary's musical talent. We were treated to a wide range of music from individual performances on vocals, trumpet, keyboard, violin and clarinet, and group performances from Year 4 drummers, recorders, 'Rap-it', African drums, guitars, Jazzies and Jazz Hands. Thank you to everyone who was able to join us, and to Friends of St. Mary's for the refreshments. On Tuesday 28th April, our Foundation Governor Mrs Lindy Illingworth and the Open the Book Team, led Collective Worship in school. They re-told the bible story of Jesus fishing with his disciples. Tonight we played our last game for this season in the City of York Football League. Thank you to all the players and supporters who have encouraged and cheered our team throughout the season, and a special thanks to Harry Watson our School Captain and Paul Bird the team coach. 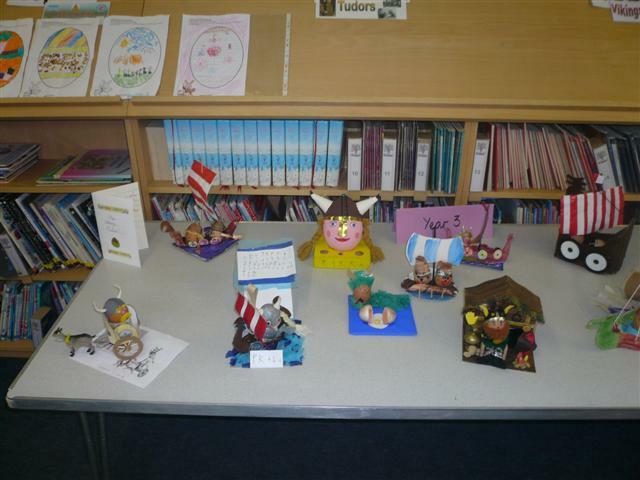 On Tuesday 24th March we held our annual Easter Egg Competition. 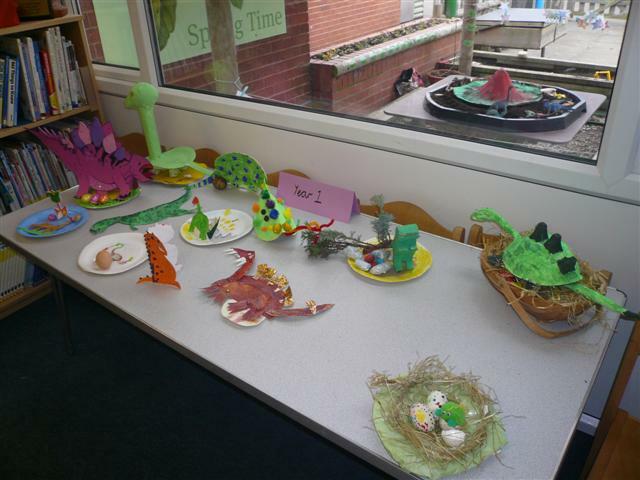 Foundation children coloured in an Easter picture, Year 1 and 2 created a dinasaur world on a paper plate, Year 3 and 4 explored 'Volcanoes and Earthquakes' as their topic, and Year 5 and 6 had 'The Tudors'. Thank you to everyone who joined in the fun as all the entries were amazing. A special thank you to the judges; Mrs Baldwin, Mrs Bartram and Mrs Ashford (Foundation Governor). Congratulations to the top three in each year group; we hope you enjoy your Easter Egg prizes! On Friday 27th March we celebrated the Easter festival at St Mary's Church in Askham Richard. Thank you to everyone who was able to join us in worship at our Service. Thank you to Mrs Beigthon for the wonderful Easter music and songs. 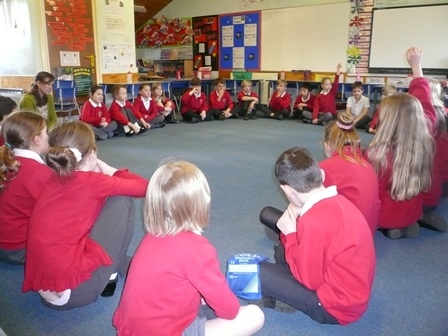 On Monday 23rd March each Class was joined by students from the University of York to lead a special music lesson. The children had a super time experiencing different musical instruments. Thank you to Mrs Holliday for organising this event. Thank you to Mrs Boast for running a very informative phonics workshop for the Key Stage One parents on Thursday 5th March. Thank you also to Mrs Gibbs for helping with the session, and the parents and children who were able to attend. Thank you to all the children and parents for making our World Book Day so special. 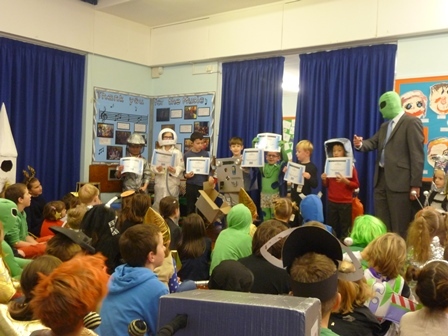 The costumes were amazing, and prizes were presented for the best dressed child in each year group. We had a fantastic day and thank you to all the Dads, Uncles and Grandads for joining in with our book readings throughout the day. Thank you to Mrs Walmsley for organising the fantastic poetry day with Wes Magee. This was a magical day with children reading and writing poems. Wes Magee very kindly signed the children's books and we were able to purchase signed copies for our World Book Day prizes. On Tuesday 24th February, we had a very exciting day as the The Lord Mayor, Sheriff and partners visited the school. The children in Class Two asked very pertinent questions as part of their 'Leadership' topic, and even tried on some of the special robes. On Wednesday 11th February explosions and bubbles filled the School Hall! 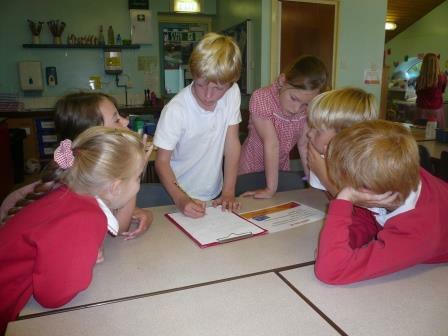 The Science Monitors promoted their Science Club which is run at lunchtime with Mrs Beighton. On Thursday 22nd January we held our annual Maths Evening where parents and children are invited into school to find out more about how we teach Maths. This year the focus was teaching and learning 'Word Problems'. Thank you to all the teachers for the superb workshops and in providing information leaflets to help with homework. 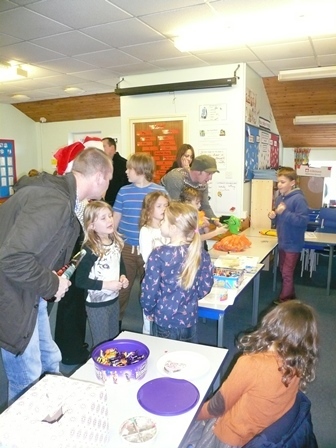 Thank you also to all the parents and children for joining in fun! During Mrs Beighton's 'Big Sing Christmas Special', there was a suprise visit from One Direction! They squeezed in a performance before heading off back on tour. Thank you to all the school cook and helpers for the delicious Christmas Dinner. Thank you to our school community for joining us in celebrating the Christmas message. 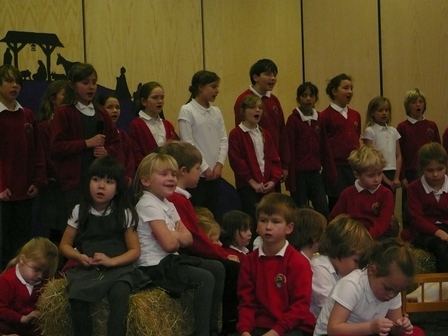 The children sang a medley of songs from our Nativity Concert as well as traditional Carols. Thank you to: the Rev Roy Shaw for his Christmas message, all the staff and children for their hard work, Class 1 for the Christmas cards, Mrs Carter and Mrs Nicholson for serving refreshments, Mrs Goodwin and Craft Club for the table decorations, and Mrs Holliday in bringing it all together. Guests were presented with a Christmas card and plant as a Christmas gift from the children. The children really enjoyed YoYo's performance of 'Peace on Earth'. They retold the story of the birth of Jesus and sang carols with the children to celebrate the Good News that Jesus brings into our lives. Thank you to everyone who was able to come to our Christmas Nativity, Stargazing. It was lovely to see so many family and friends from all over the country and we appreciate you making the special journey to share our celebrations. The staff and children have been fantastic in organising and preparing for this event and it has been a real team effort, all brought together by Mrs Beighton. 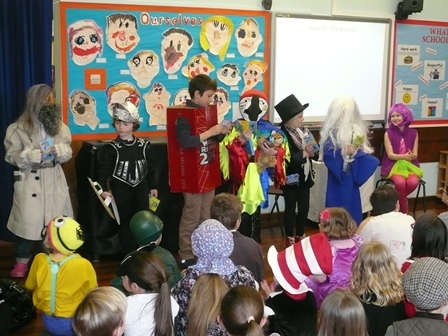 Thank you to parents for the super costumes and helping the children learn their words and songs, to Askham Bryan College for the hall, and Friends of St. Mary's for the refreshments. Our children are amazing and we are extremely proud of them. A huge thank you to the Friends of St. Mary's (FOSM) for organising such a fabulous Christmas Fair, and to everyone who came to support. We raised over 1400.00 and this money will be used to enhance the learning resources for the children. 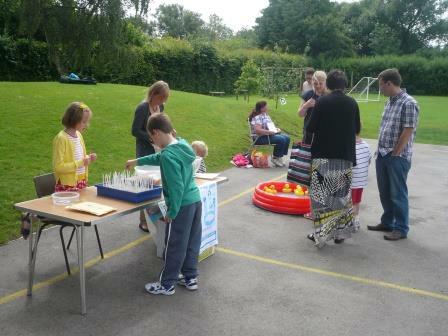 Thank you to Class 3 and 4 for the wonderful games, all the stall holders and adults who ran the activities. The hot turkey sandwiches and cakes went down a treat, and even Father Christmas made a suprise visit! What a fantastic afternoon. Thank you to Mrs Elgie and the children in Class 4 for their wonderful banner on Peace. 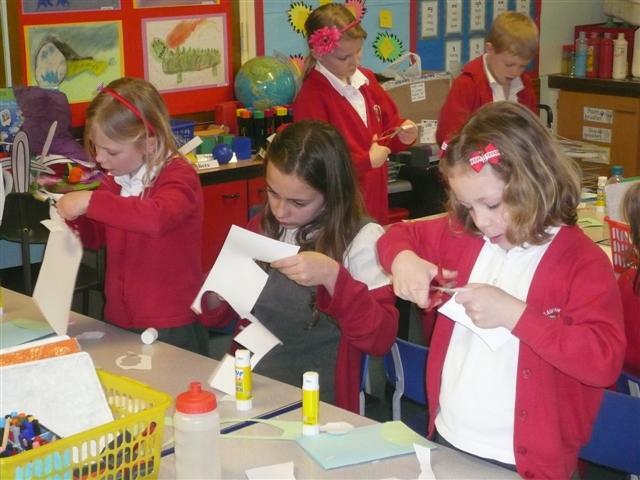 This christian value was chosen by Class 4, and all the children have contibuted to the making and overall design. It is proudly displayed in the school cloakroom area. Thank you to all the Grandparents who were able to join us for our annual Grandparents Morning making Christmas decorations. This is our official first day of glitter and glue. The children had a wonderful time and greatly valued your time and help. Thank you also to Friends of St. Mary's for providing refreshments. We had a fantasic day raising money for Children in Need and altogether we raised 270.60. 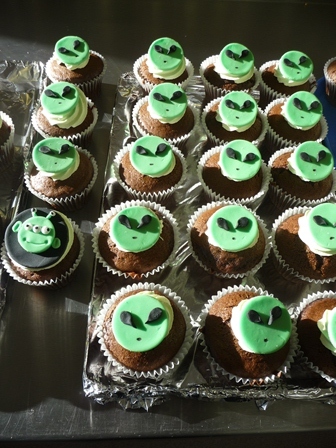 Thank you to all the children and adults for dressing up as a hero for a day, to the School Council for running the Children's Book Fair, and the Hero Bakers for providing all the wonderful cakes and buns. Thank you for your kind and generous donations to this charity. The children in Class 2 have had a wonderful day learning about the Hindu festival of light called Diwali. They produced some wonderful Mendhi patterns using beans and pulses, painted patterns on their hands, drew Rangoli patterns and used batik. Thank you for everyone who has been able to donate a Christmas Box to Operation Christmas Child. This is a project run by the Christian relief and development organisation Samaritan's Purse. Their mission is to demonstrate God's love in a tangible way to needy children around the world, and together with the local church worldwide, to share the Good News of Jesus Christ. All the boxes are given to children based on need, regardless of their background or religious beliefs. It is a gift of unconditional love. These boxes were collected today and will help make a child feel loved at Christmas time. Thank you to Class 4 for leading the school in our Remembrance Day Service. 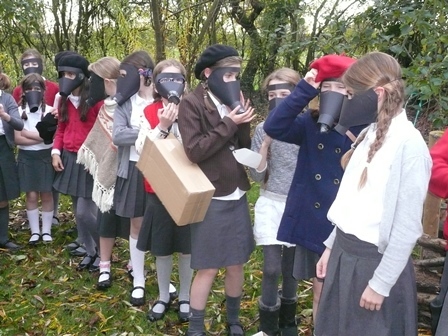 The children shared poignant family history from WW1 and helped the school understand our Nation's history. Thank you to everyone for wearing their Royal British Legion poppy with pride and observing the two minute silence. This is our Remembrance display in school, with all the poppies made by the children across the school. Thank you to everyone who was able to join us in our Harvest Service at St. Mary's Church in Askham Richard on Friday 26th October 2014. It was wonderful to be welcomed into church with the new bell calling us to worship. The collection was shared between Christian Aid and the Church. On Friday 18th July the Year 6 children held their Leavers Assembly. It was lovely to hear about their happy memories of the school and ambitions for the future. They have been a fabulous year group and we wish them all the very best for the future. The parents of the year 6 children presented the school with a locally crafted bench as a leaving gift, and the children were presented with a bible from the Foundation Governor, Mrs Lindy Illingworth. On Thursday 17th July the children had a very exciting afternoon utilising their times tables skills for the annual Times Table Tussle. Prizes were awarded for each year group. Thank you to Mr Jones for organising this event and the children for learning their tables so well! 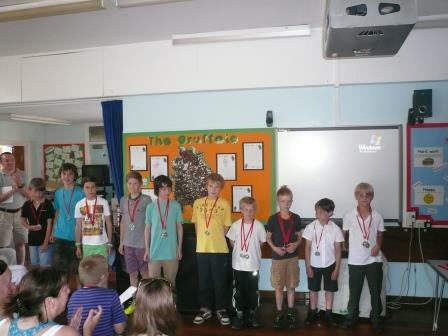 On Tuesday 15th July we held our annual Sports Evening to celebrate the sporting achievements of the children in school. Thank you to Mr Jones for organising this event and Mr Peter Cannings (Chair of Governors) for presenting the medals. On Friday 4th July, the whole school was treated to a superb Guitar Concert by the children undertaking guitar lessons with Mr Curry. If your child has been inspired to start playing the guitar, please contact the School Office for contact details. The whole school celebrated Le Tour de France with a super day of fun activities; designing and making fridge magnets, DT challenge, French cricket, bicycle designs and face painting by Mrs Rodden. The school was adorned in red, white and blue flags, with hand made yellow flags in the school hall. The highlight of the day was the French Cafe 'Le Velo Jaune' organised and run by Mrs Walmsley with members of Class 3 and 4. They served a range of French pastries provided by Tescos to the whole school, all speaking in French! ISS Catering entered into the spirit of the day by serving a French style lunch offering a delicious range of baguettes and salad, followed by French apple tart for pudding. Congratulations to Seth for cycling 20 miles from Driffield to Bridlington, joining the 'White Rose Sport' on their final leg of their three day coast to coast ride, to raise money for Brain Tumour Research and Support. He was presented with a gold medal to celebrate this achievement. Thank you to everyone who has supported him. Congratulations to the Tag Rugby Team who represented The City of York at the North Yorkshire School Games on Sunday 29th June at Queen Margaret's School. It was a long day for the children, teachers and parents, but is was fantastic! The children showed great team work, determination and sportsmanship. We are all very proud of their achievements. A big thank you to FOSM for organising such a fabulous BBQ following Sports Day. They raised over 470.00 for the school and everyone had super time. 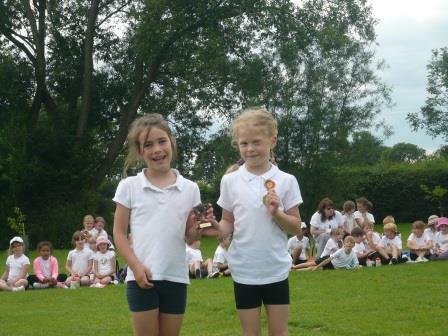 On Wednesday 25th June we held our annual Sports Day. Thank you to everyone for a fantastic afternoon of sport. The weather was perfect and the children had a super time. It was lovely to see our new Reception children and parents joining us for the afternoon. Congratulations to Mr Simon Ripley for being awarded Employee of the Month from York City Council. He is a very dedicated and highly valued member of the school team. On Thursday 12th June the Year 6 children participated in our Small Schools Partnership sports event held at Stockton on Forest. There were a combination of sporting and initiative exercises to challenge and develop team work. Thank you to Mrs Walmsley and Mrs Goudge for accompanying the children. Well done to all the children who entered the Big Sing Challenge Cup. Special guest judges were Ms Wilson (Year 7 Transition teacher from Tadcaster Grammar School) and Miss Buckley (Music specialist from Tadcaster Grammar School). Each class performed a song and were judged for musicality, performance and participation. After much deliberation, Class 3 were announced as this year's winners! Thank you to Mrs Beighton for organising this very exciting event. 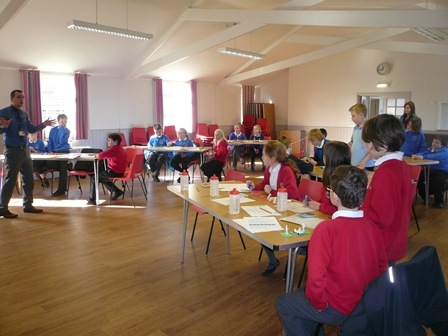 On Tuesday 10th June the Year 5 children went to York University to participate in an 'Enterprise Challenge' organized by Tadcaster Grammar School. On Tuesday 20th May, we proudly opened our new art gallery. Many thanks to Mrs Goodwin and the children for their hard work. 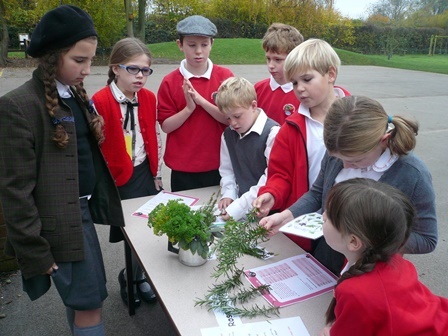 On Monday 19th May, the school Gardening Club held their annual plant sale. 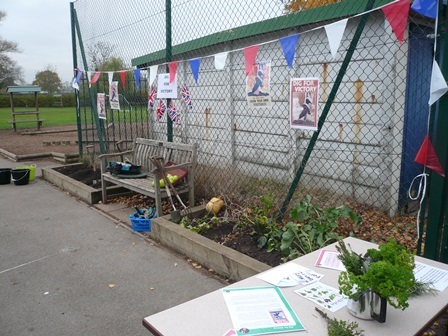 There was a wide selection of flowers, vegetable and herb plants for sale, and all proceeds are used for gardening club resources. Thank you to Mr Whiteman and Mrs Gibbs for organising this popular event. 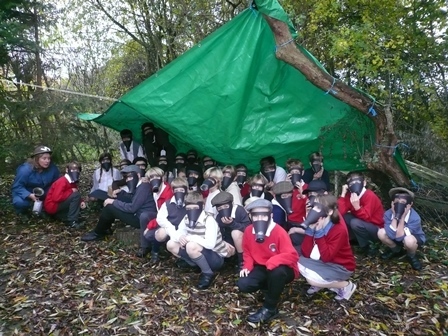 On Friday 16th May Class 4 went to our 'Forest School' area to celebrate the end of SATs week and were treated to sausages and toasted marshmallows! The children and staff had worked extremely hard and deserved a well-earned treat! St. Marys has been selected by the National College for Teaching and Leadership (NCTL) to become part of a new National Teaching School in York. Teaching Schools strive to raise standards through school-to-school support, engage in research and development, and identify and implement change to improve practice. The Pathfinder Teaching School Alliance is a community of schools in partnership with the Diocese of York and includes: Archbishop Holgate's School a CE Academy, Hempland Primary, Warter CE VC Primary and Wilberfoss CE VC Primary Schools. The Director of Education for the Diocese of York, Dr Ann Lees commented "This is an exciting development that builds on the shared values of these schools, their care for all children and young people and their commitment to educational excellence. The Diocese is proud to work with them in an initiative that will have a huge impact on many schools in our region and the communities they serve." Charlie Taylor, the Chief Executive of NCTL, said: "The Pathfinder Teaching School Alliance should be very proud of their Teaching School status. It recognises the school's outstanding performance and its track record of raising standards through supporting other schools. There are now more than 500 designated Teaching Schools around the country with more to follow. In an increasingly school-led system, they are leading the way in training new teachers and helping existing teachers develop their skills ensuring we'll have the best people teaching our children for generations to come." The Chair of Governors at St Mary's CE Primary has been chosen for a national role supporting other chairs of governors to improve the standard of governance and school academic performance. Mr Peter Cannings was one of only 100 governors to be recently appointed to the role of National Leader of Governance (NLG) by the National College for Teaching and Leadership (NCTL). National Leaders of Governance are highly effective chairs of governors who will use their skills and experience to support chairs of governors in other schools and academies in a range of different circumstances. Charlie Taylor, Chief Executive at the National College for Teaching and Leadership said "Governors are the people who appoint the headteachers and hold them to account so they have an essential role to play as leaders in our schools. High quality governance is vital for improving school performance and it is excellent that experienced chairs of governors like Peter are willing to give some of their valuable time to help other chairs and schools who will benefit enormously from their support". On Friday 2nd April we held our annual Summer Music Concert at Askham Bryan Conference Hall and were treated to a medley of music. Performances included choir, Overture, Jazzies, Jazz Hands, recorders, drummers, singers, guitars, violins, cornet, woodwind, keyboards and singers. Thank you to FOSM for providing refreshments and for the fantastic support from family and friends. Our annual Easter Service was held at St. Mary's Church in Askham Richard. Thank you to everyone for joining in with our Easter celebrations. 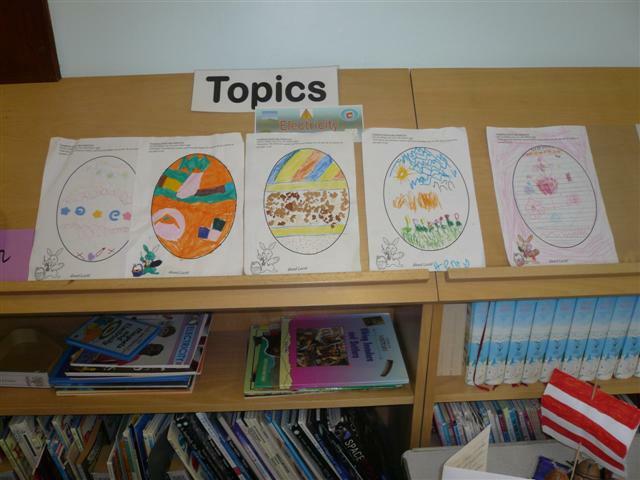 Thank you to all the children and families for the fabulous Easter Egg Competition entries. 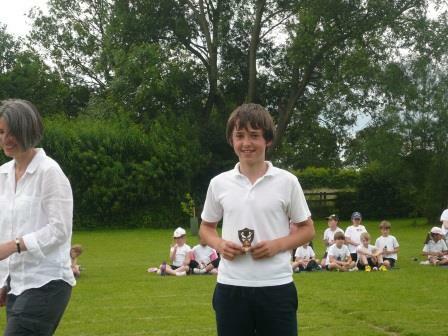 Prizes were awarded for first, second and third places for each year group. Many thanks to Mr and Mrs Cannings (Chair of Governors) and Mrs Baldwin for judging the competition. On Wednesday 26th March we enjoyed our Easter Craft Day where the children made Easter baskets, cards, chickens and rabbits! Thank you to all the volunteers who helped out for the day. 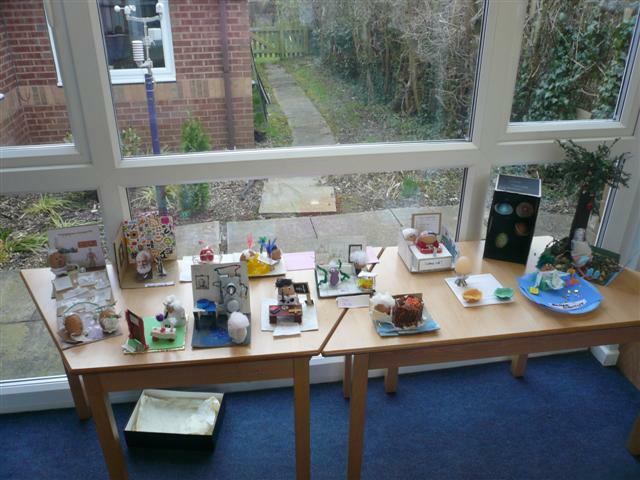 The Year 6 children also made Easter Gardens for our Church Service with Mrs Goudge. Thank you to Mrs Boast for organising and presenting, Mrs Gibbs for assisting, and the children for participating in our Phonic Workshop for KS1 parents. Mrs Boast demonstrated a phonic session and provided handy hints to help children learn to read. What a fantastic day we had celebrating books and the love of reading. Thank you to everyone who dressed up and especially the Dads and Granddads who joined us for the day. On Friday 28th February the whole school participated in 'Reflection' workshops delivered by YoYo. 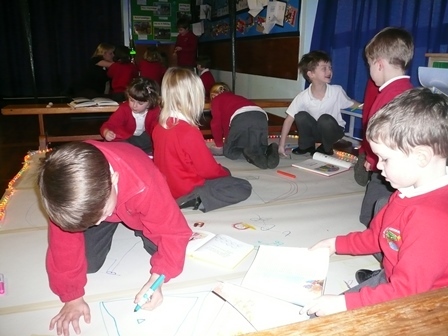 They transformed our school hall into differing reflection zones and delivered class sessions throughout the day. 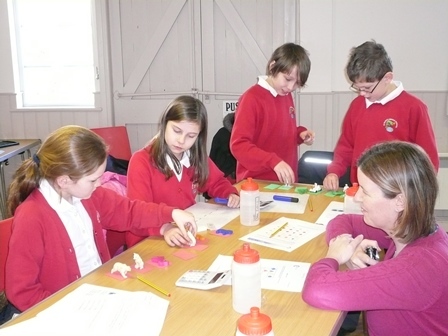 On Thursday 27th February some of our Year 6 children worked alongside other keen mathematicians from our Small School Partnership on a Maths Challenge at Naburn Primary School. Thank you to Naburn Primary School for organising and hosting this event, and Mrs Gee for accompanying the children. Thank you to the school cook, Midday Supervisors and parent helpers for ensuring that we had a wonderful Christmas dinner celebration! 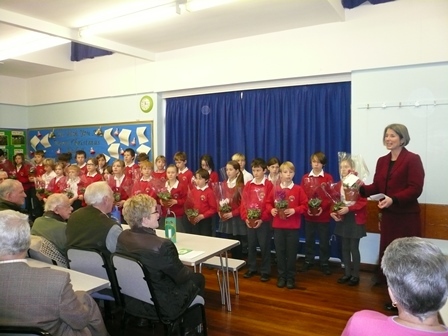 On Tuesday 17th December 2013, the children entertained our community with traditional carols and a variey of songs from our Nativity Concert. 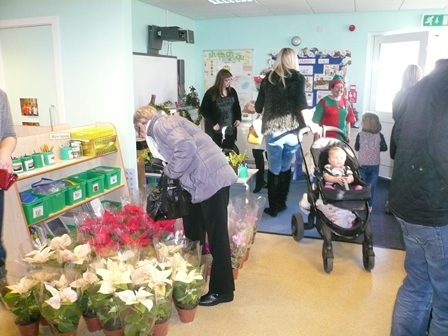 Everyone was presented with a Christmas card and plant to wish them a 'Very Happy Christmas'. The Rev. Roy Shaw lead the worship and prayers. Thank you to Friends of St. Mary's for funding the Riding Lights theatre group to school. The children thoroughly enjoyed the performance! 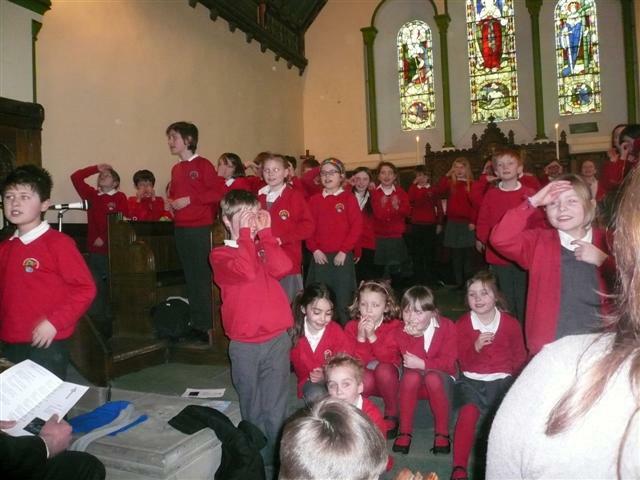 On Friday 6th December the children performed our Christmas Nativity at Askham Bryan Conference Hall. Thank you to everyone who was able to come and support this annual event, many travelling great distances to see children and grandchildren. 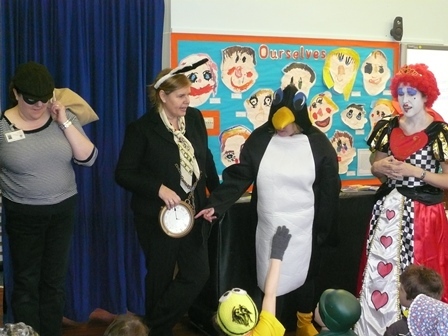 The children really enjoyed the performance and appreciated all the hard work of Mrs Beighton and the teachers. Thank you to Friends of St. Mary's for providing the mince pies and mulled wine and help make this event so special. 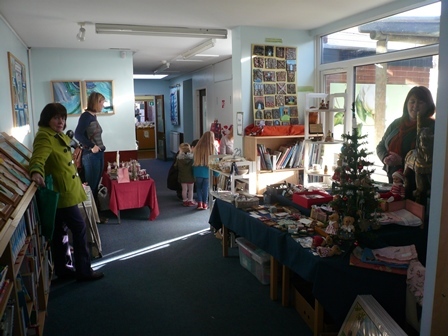 Thank you to FOSM for all the hard work in organising and running our annual Christmas Fair. We raised approximately 1385.00 pound and all proceeds will go towards providing additional educational resources and provision for the children. Everyone had a great time, and the children especially enjoyed the games and visit from Father Christmas! Thank you to all the Grandparents who were able to come and help the children make their Christmas decorations and also our 'extra' Grandparents who were adopted for the morning to help out! The children really enjoyed working alongside each other and have now placed the decorations on the Christmas Tree. Thank you to Friends of St. Mary's for serving refreshments. Thank you to everyone who has looked after the Holy Family as they have travelled on their way to Bethlehem. 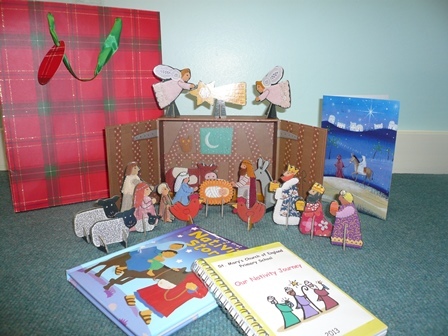 We are delighted that you have enjoyed sharing the Nativity story and scene with your family and have thoroughly enjoyed reading your diary entries. Thank you to Friends of St. Mary's (FOSM) for organising a Bingo Night for the children. Everyone had a great time! 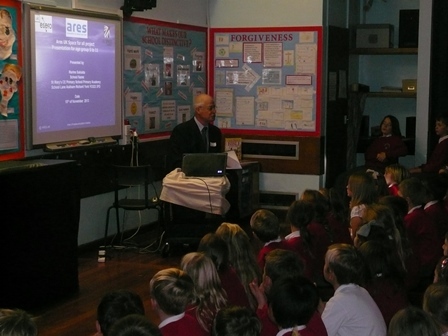 Mrs Beighton secured a fantastic opportunity for the children to meet Mr Marino Saksido, a representative from the International Space Agency, on Friday 15th November. He presented a whole school assembly and undertook a question and answer session with Class 4. He explained what it is like to work at a space agency and it was amazing! 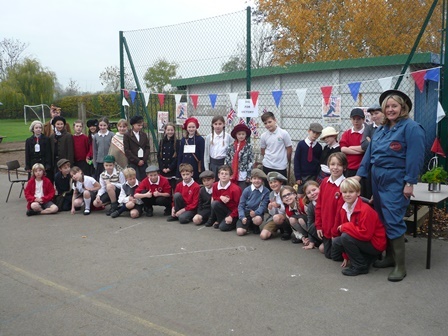 On Monday 18th November, Mrs Walmsley organised a WW2 Day at school for Class 4. 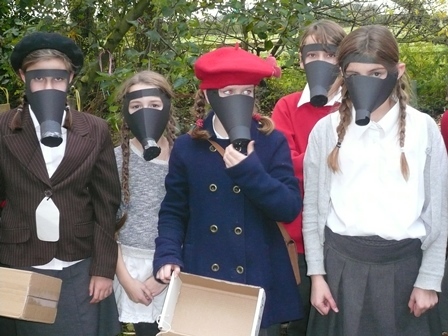 The children dressed up in costume and undertook a wide variety of activities including; digging for victory, rationing, 'Make do and mend', apple crumble, gas masks, rag rugging and even an air raid! 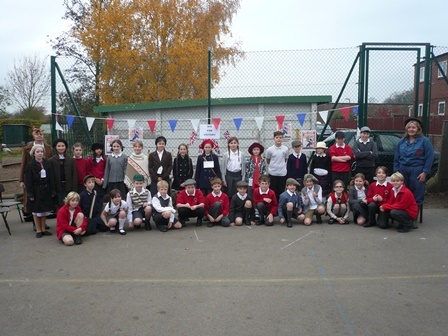 On Thursday 14th November school held a 'Spaced Theme Day' to raise money for Children in Need. We raised a fantastic 152.55 pound! 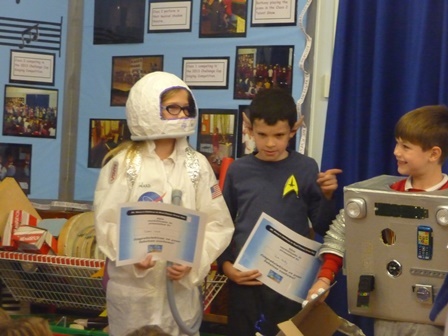 Thank you to the children who came in the most fantastic space themed costumes and to the School Council for organising the event. 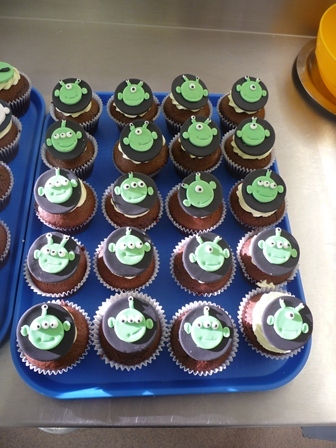 Many thanks also to Mrs Hobson, our school cook, for creating these wonderful treats for the children to enjoy on our Space-themed day. 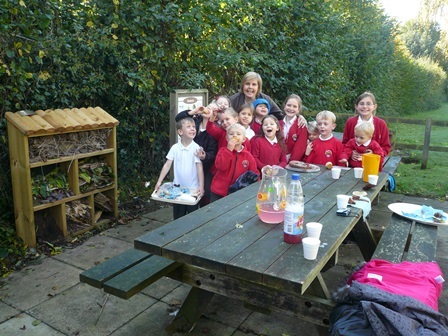 Mrs Beighton and the Science Club officially opened the bug hotel with a party to celebrate the occassion! Thank you to all the children for making ladybird biscuits, worm cakes, butterfly cupcakes, spider chocolate cake and many more 'bug' themed treats! Thank you to everyone who was able to join us on Friday 27th September for our annual Harvest Service at St. Mary's Church Askham Riichard. The service praised God for the wonderful world in which we live and for the gifts provided to us through readings, poems and singing by the children. The Rev Roy Shaw lead the prayers and gave the blessing. The collection was shared between the Church and Christian Aid. Thank you also to all the families who brought in tins of food for the Salvation Army. These have now been delivered and may we pass on their appreciation of your support for their work in York. 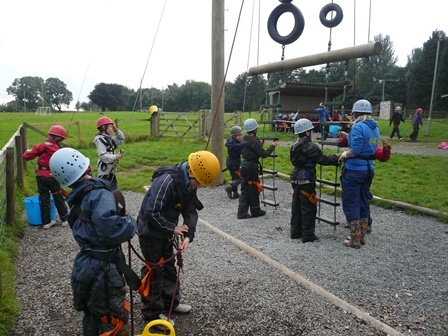 Class 4 went to Winmarleigh Hall for their residential week commencing Monday 9th September and had a fabulous time! A big thank you to Mrs Gee, Mrs Walmsley, Mr Jones and Mrs Goudge for accompanying the children. Thank you to the Year 6 children who presented the school with a 'Bug Hotel' and bird station as a leaving gift during their leaving assembly. The Chair of Governors presented the children with a Bible and wished the children well as they moved on for their secondary education. They have been a great year group, and we will miss them! On Tuesday 16th July, we celebrated the sporting achievements of the school in awarding medals to all the children who had represented St. Mary's in sport over the last year. We have fielded: Netball, Tag rugby, Football, Hockey, Cricket and Swimming teams, as well as having many other sporting opportunities over the year such as orienteering, karate and athletics coaching. Thank you to the children for all their teamwork and sportmanship, parents for helping with transportation, supporting and washing the team kits, and to all the staff for their volunteer work in running these additional clubs for the children. 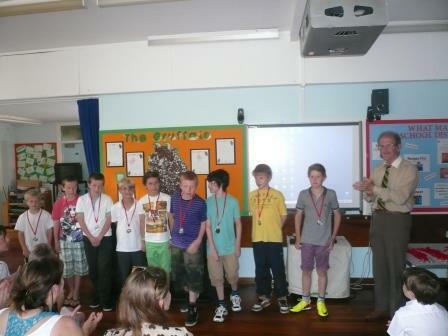 The medals were presented to the children by Mr Peter Cannings; Chair of Governors. Thank you also to Mr Jones for co-ordinating school sport over the year and for organising the super trophy evening. 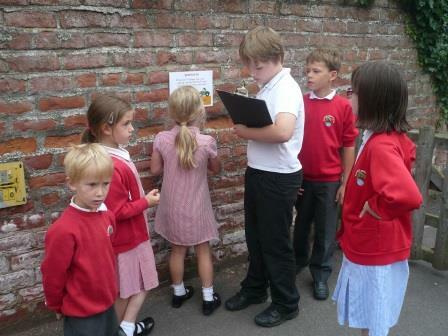 On Wednesday 17th July, Class 4 and Mrs Gee organised a fantastic Maths Trail morning for the whole school to enjoy. Activities were wide ranging and challenging, including tangrams, puzzles and practical activities. What a great way to learn and apply our mathematical skills- thank you Class 4. 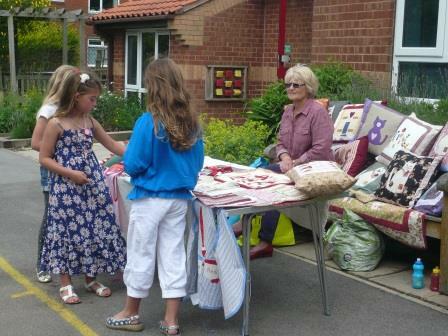 Thank you to Mr Jones for organising a fantastic 'Times Tables Tussle' on Friday 5th July 2013. The children have been learning their times tables at home and school, and rose to the challenge of the Times Table Tussle! Well done to everyone for taking part and to the winners for each year group. 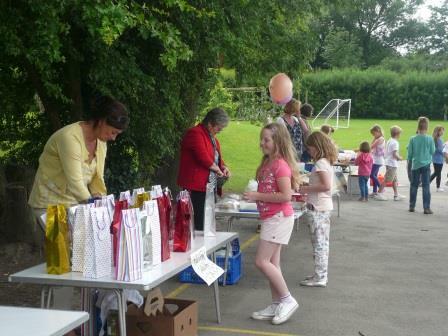 A very big thank you to the Friends of St. Marys (FOSM) for organising such a fantastic School BBQ for children and families on Saturday 29th June 2013. What a fantastic week! The children have enjoyed a fun week focussing on health. Activities have included: talking to the police about keeping safe, healthy food with Tesco, fruit tasting with ISS Catering, Boots talking about looking after yourself and keeping clean, karate and athletics. 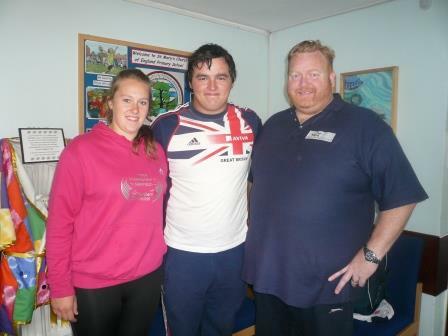 A highlight of the week was when a British Olympian visited the school with his coach Mr Wilson. A special thank you to Mrs Armstrong for organising the visitors into school. 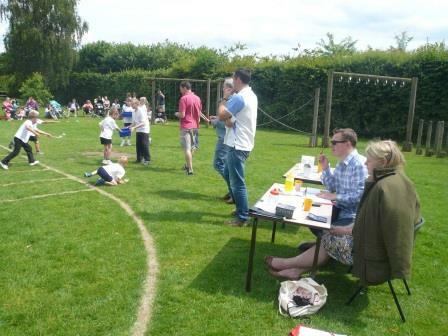 Thank you to everyone who was able to come and support the children on our annual Sports Day. The weather stayed fine and we were able to enjoy an afternoon of races and fun! Trophies were awarded to the winning girl and boy in each year group. Thank you to Friends of St. Mary's (FOSM) for the super refreshments of strawberries, cream, shortbread and fruit punch. Thank you to all the children and staff for their hard work and a special thanks to Mr Jones for organising this successful event. 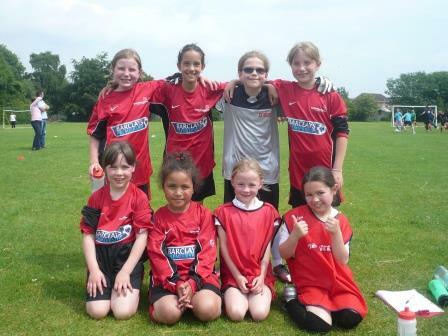 On Wednesday 19th June 2013, our Year 3 ,4 and Year 5, 6 Girls Football Teams represented the school at the Girls Football Festival held at Copmanthopre Primary School. This event was organised and run by Paul Bird, an FA Coach. We had a fabulous time and many thanks to Mr Mc Vey for helping manage the teams and Mr Hogg in helping out with the overall running of the Festival. Thank you also to all the parent supporters who were able to come and cheer us on! 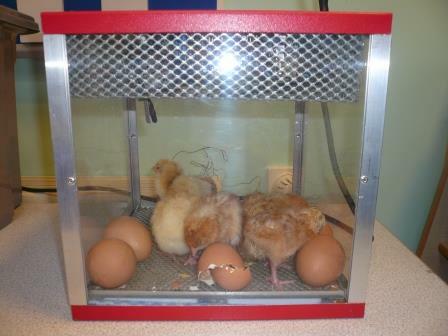 On Monday 10th June, Class 2 had a delivery of chicken eggs and they have been carefully watching and listening for them to start hatching. 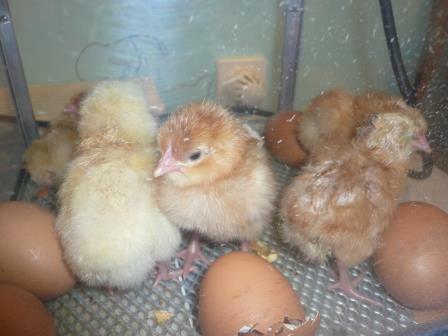 By the end of the week we had 8 chickens! This has been part of their science progarmme of study learning about life cycles. 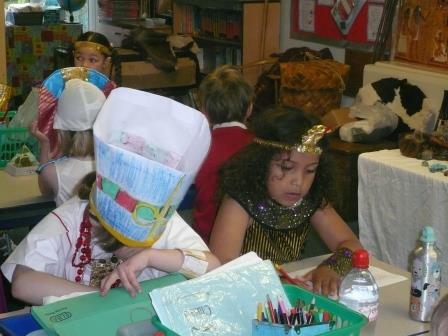 On Monday 10th June Class 3 had an Egyptian Day. Thank you to all the children who dressed up to make it a very special day! 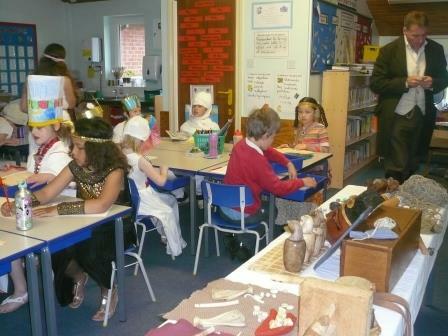 A visiting historian brought a range of artefacts into school which greatly enhanced the childrens learning. On Wednesday 5th June 2013, the whole school were involved in an RE day focussing on 'Faith Leaders'. This was delivered by YoYo, a York Youth Christian Group. On Wednesday 22nd May, the children of St. Mary's were involved in an exciting 'Big Sing Challenge Cup' organised by Mrs Beighton. Each class presesented a song to a select panel and were judged on their singing, overall performance, entertainment and inolvement of all the class. 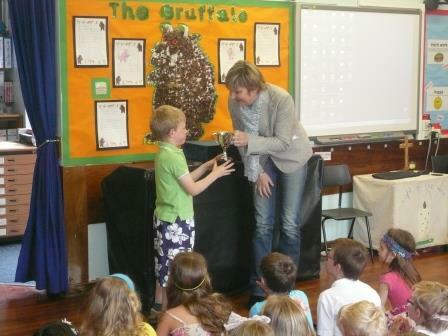 Mrs Daniels was the guest judge and awarded the winning trophy to Class 4. Well done to Mrs Beighton and all the children for a very entertaining morning! 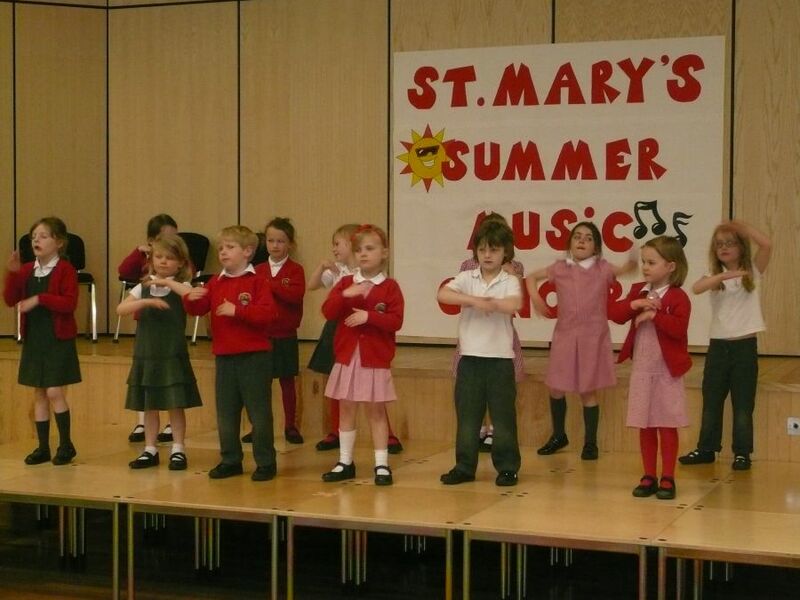 On Friday 26th April we were treated to an evening of music from the children of St. Mary's. Performances included drumming, violins, recorders, singers, keyboards, Jazz Hands and Jazzies. Thank you to everyone who was able to join us for our Easter Service on Thursday 28th March at St. Mary's Church in Askham Richard. 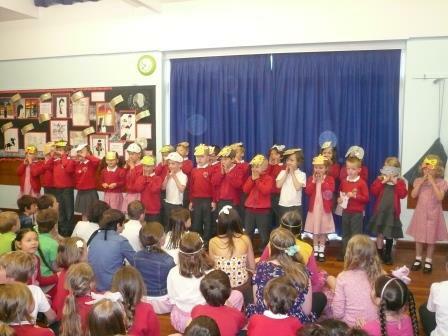 The children performed a variety of songs and readings, and showed their Easter bonnets, cards, finger puppets, egg cosies, baskets and Easter Gardens. Thank you to the children who entered our Easter Competition and our judges who had a very difficult task in deciding the prize winners! All the children were commended for their creative and artistic work. Prizes were awarded for first, second and third places in each year group and an overall Judges Special was given. A special thank you to Mrs Baldwin from Askham Richard, and Mr and Mrs Cannings (Chair of Governors) for judging the Easter Competition. 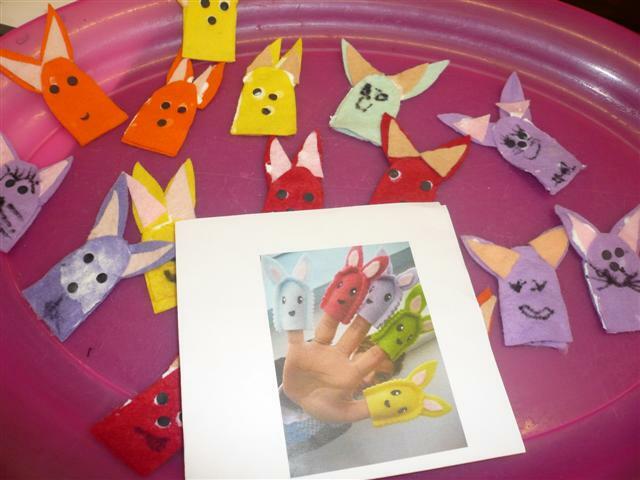 On Wednesday 20th March 2013 we held our Easter Craft Day. 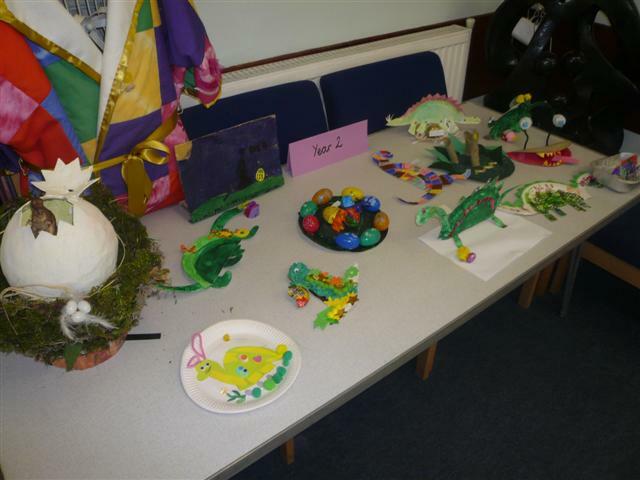 All the children were placed in mixed age groups and enjoyed making a variey of things to celebrate the Easter Festival. 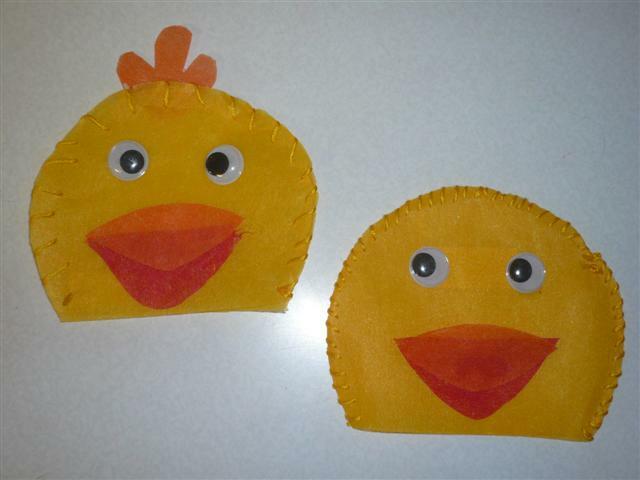 We made Easter chicks, cards, bonnets, baskets and egg cosies.